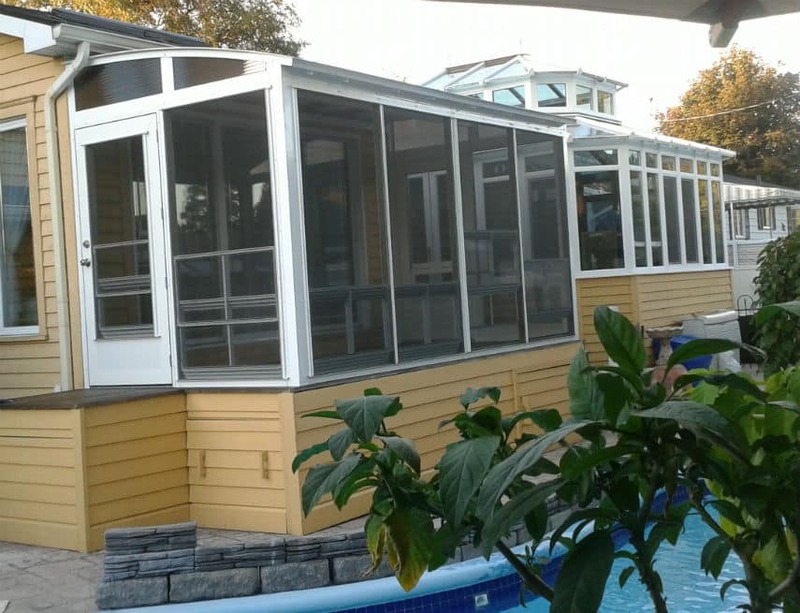 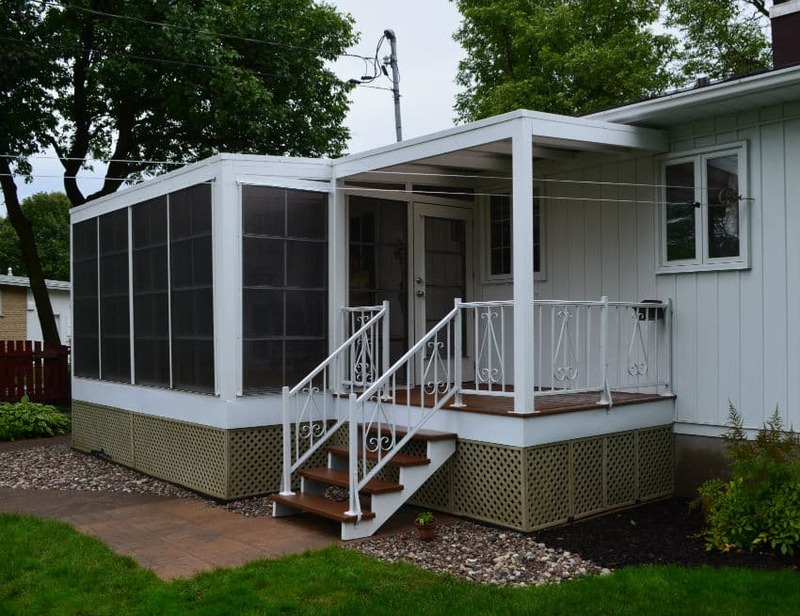 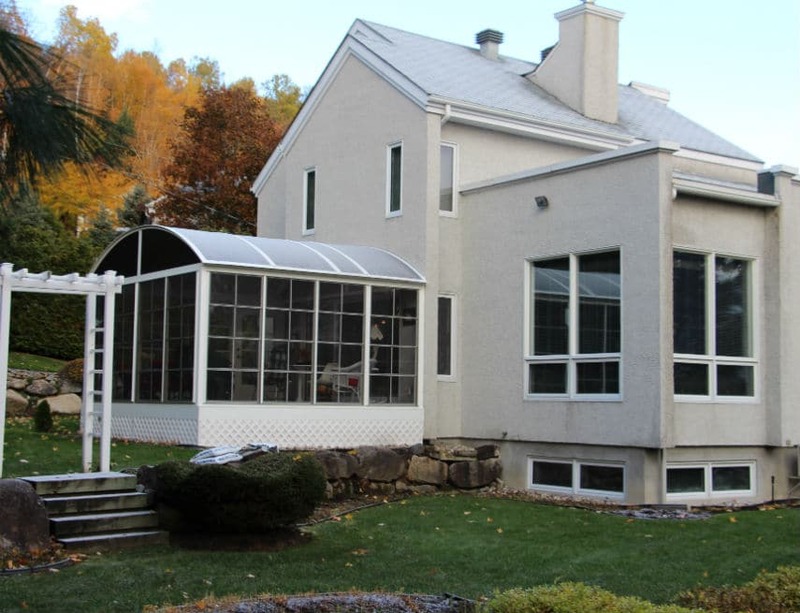 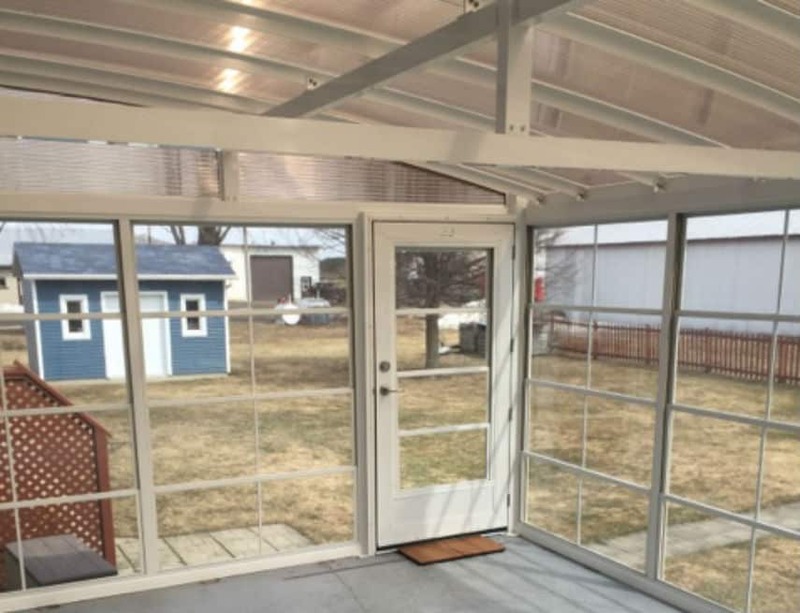 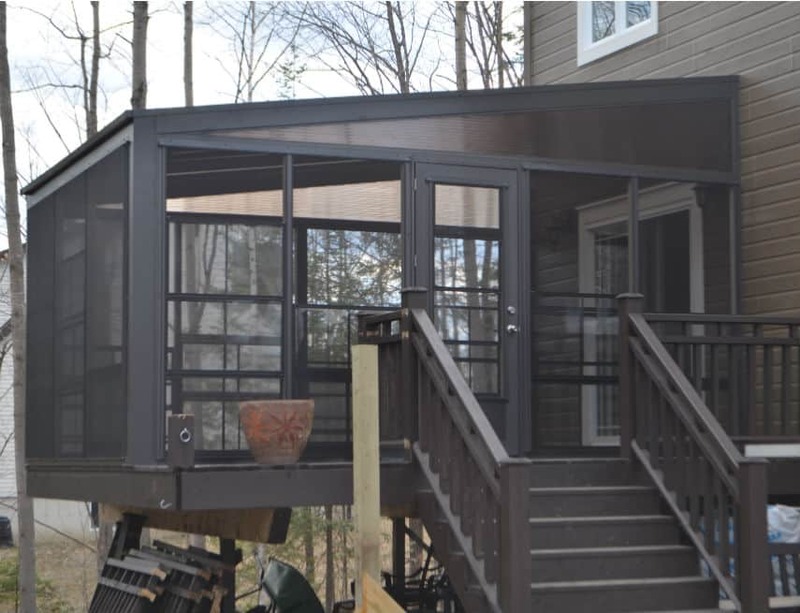 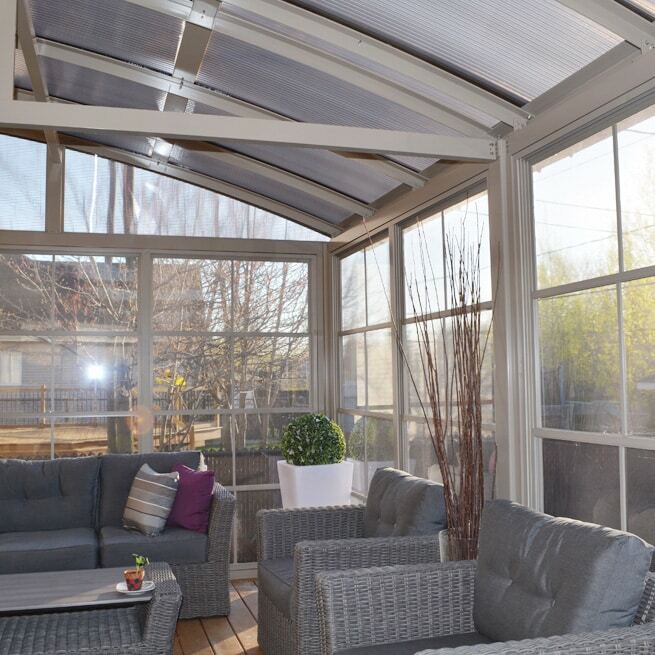 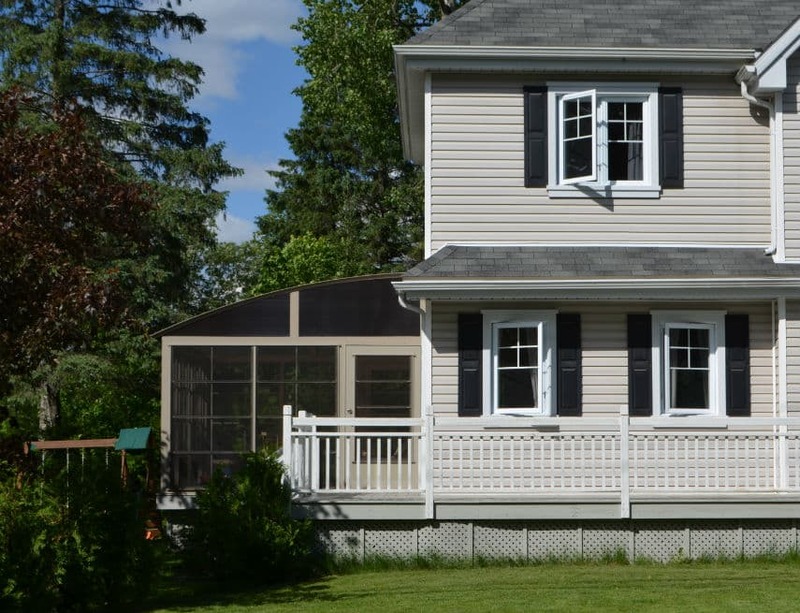 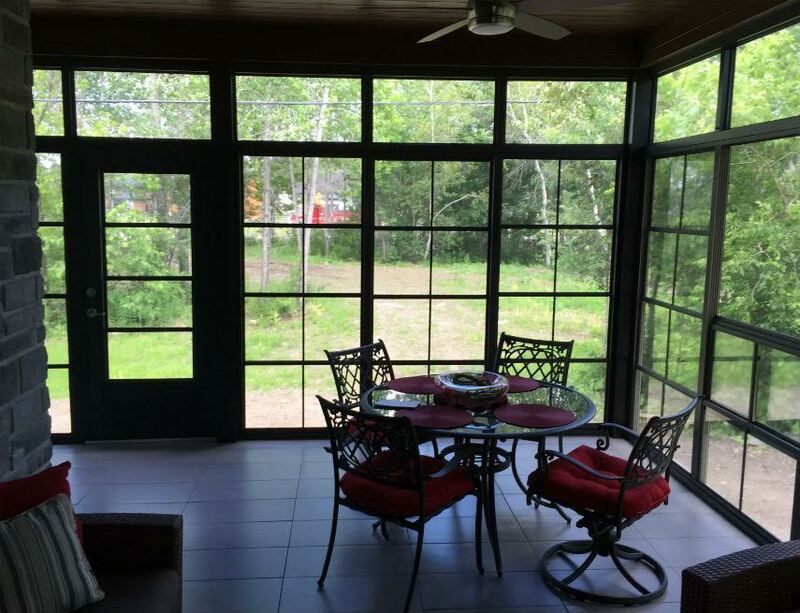 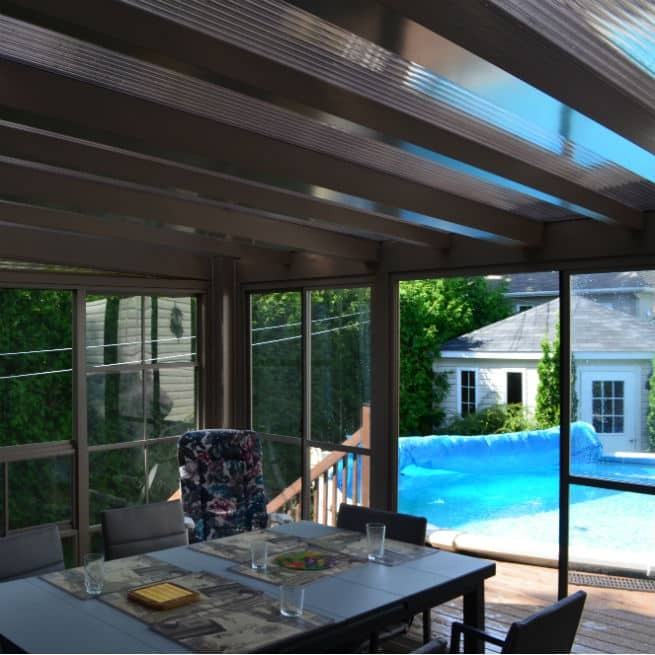 Our 3-season solariums and verandas are designed to provide you with unequalled comfort. 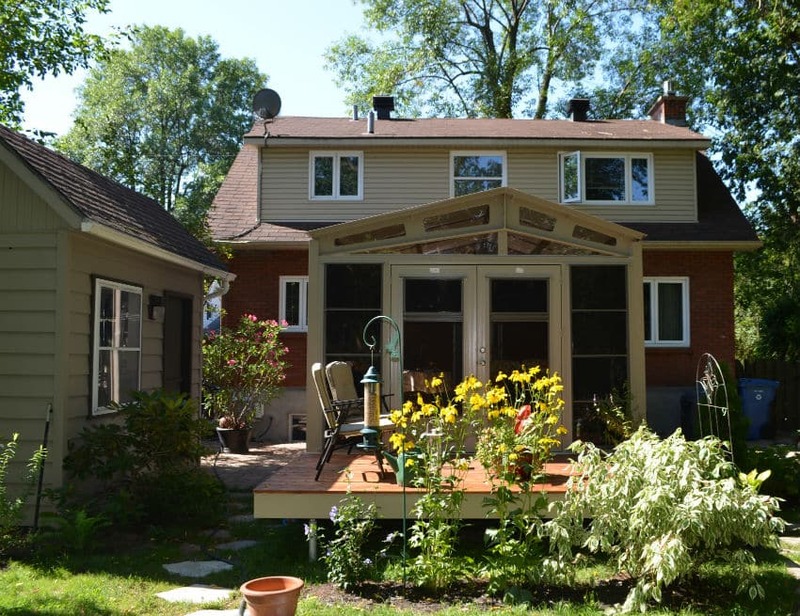 The 16 mm. 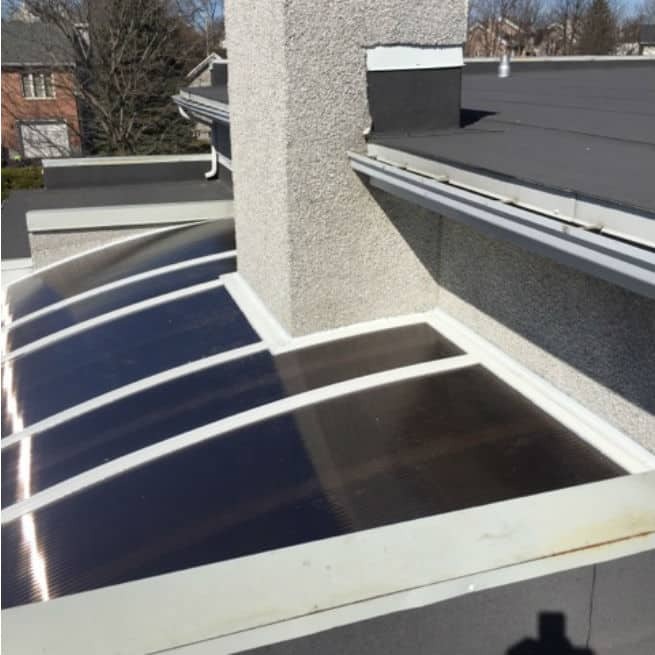 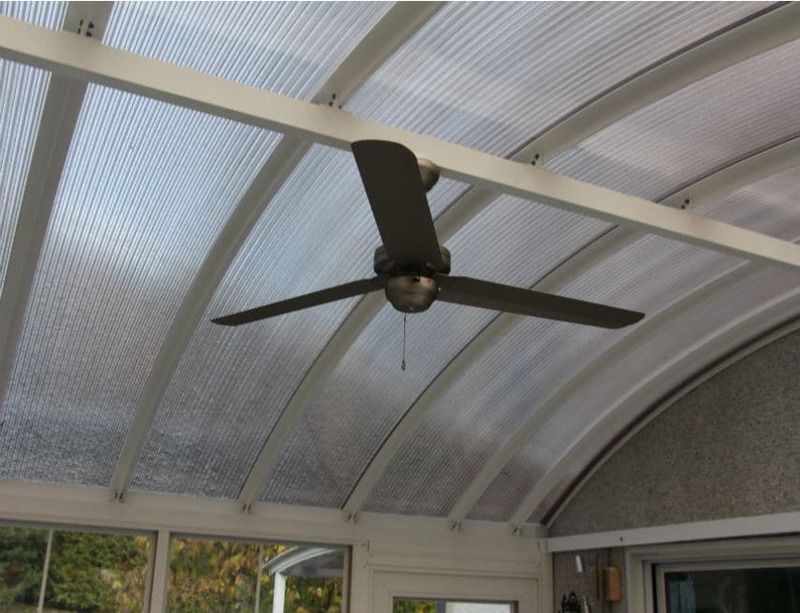 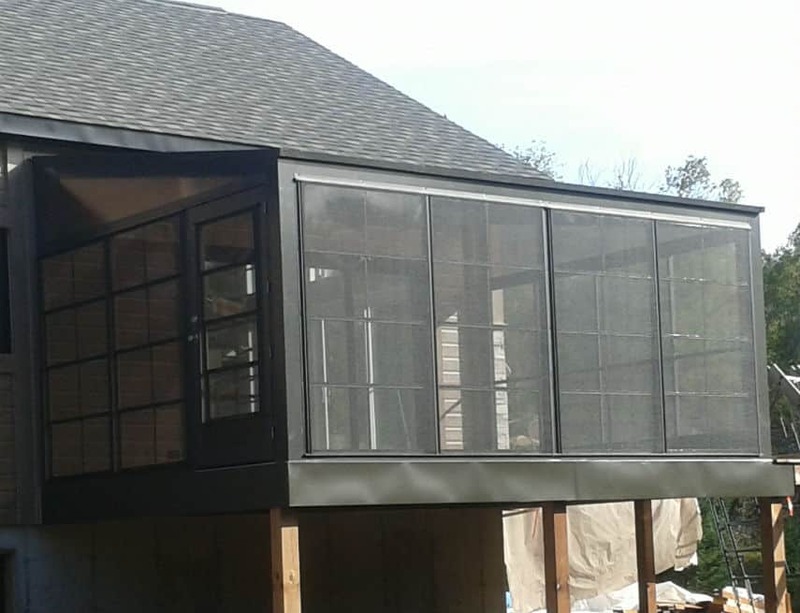 thick smoked polycarbonate roof offers insulation superior to glass together with UV protection against the sun’s harmful rays. 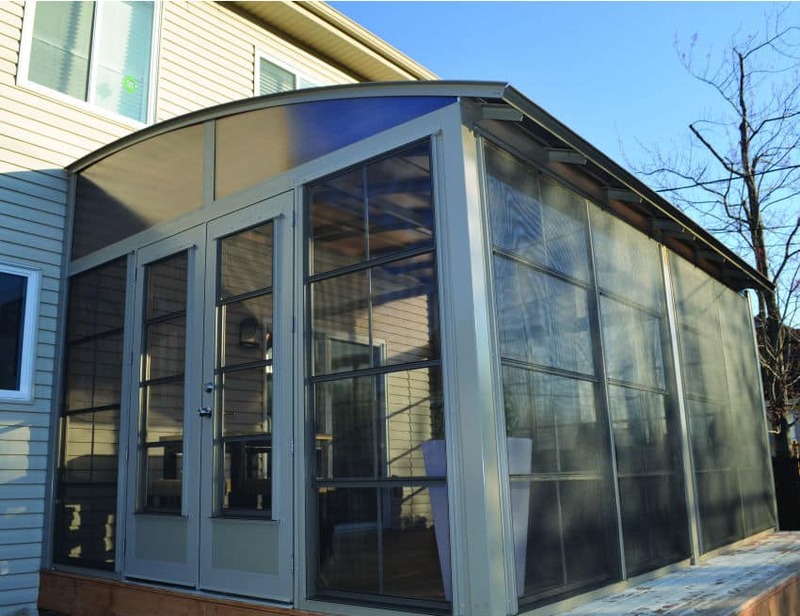 There is no greenhouse effect so you can enjoy a pleasant environment. 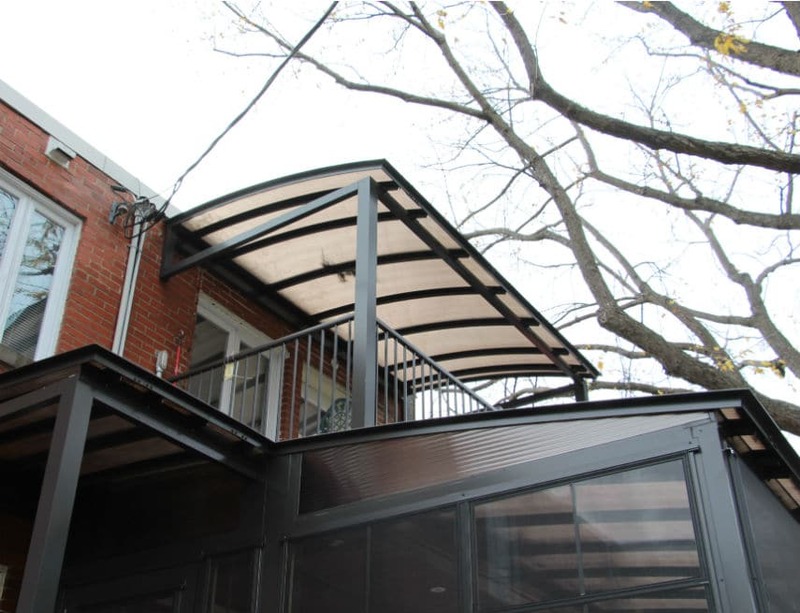 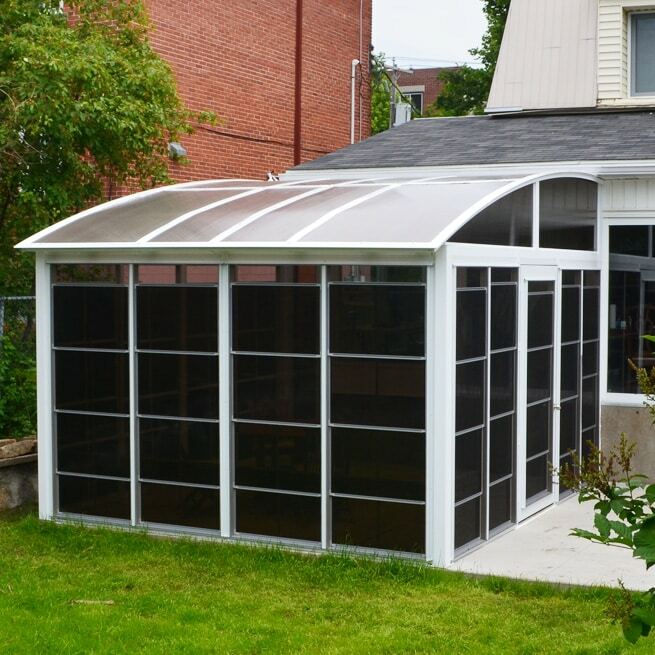 At Tendal, with comfort always front of mind, our goal is ideal fenestration for our shelters. 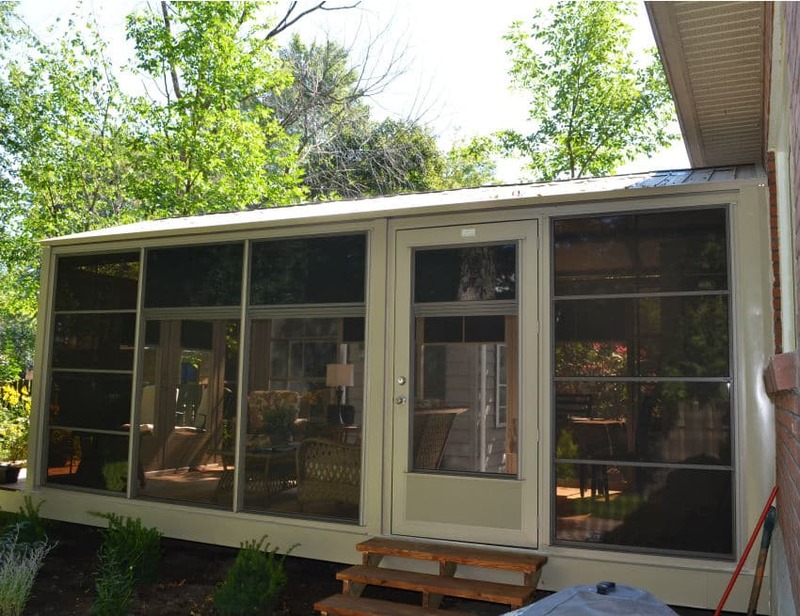 Vertically sliding windows allow for perfect ventilation control and open to 70% of their total surface. 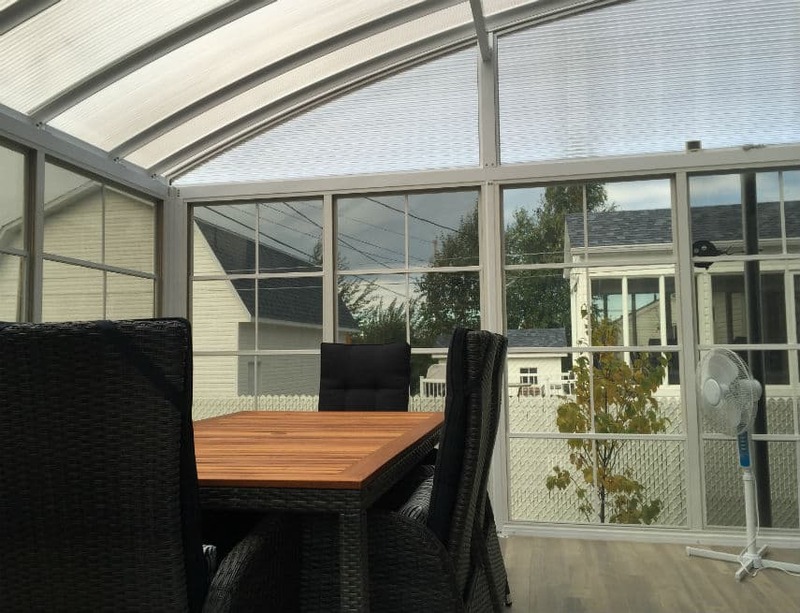 In addition, superior quality fibreglass flyscreens are permanent fixtures perfectly integrated into the fenestration system. 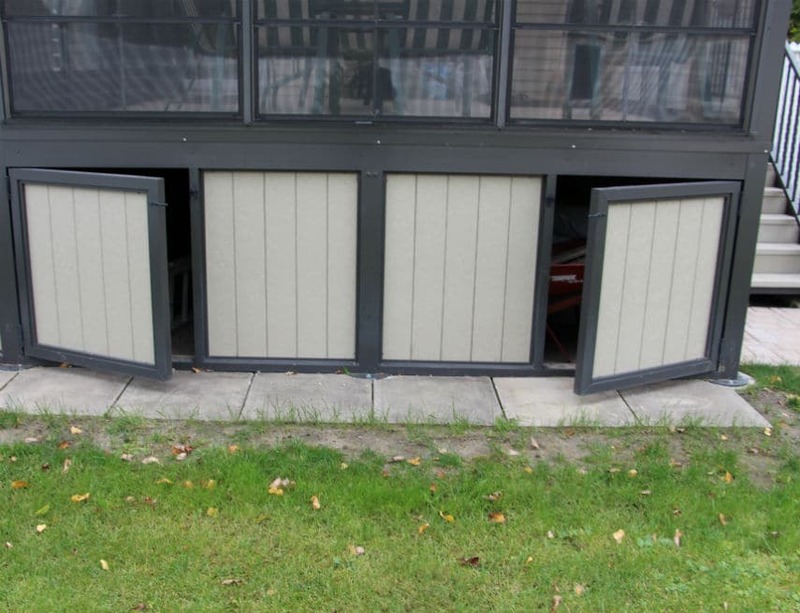 There’s nothing to handle, nothing to remove and store in winter. 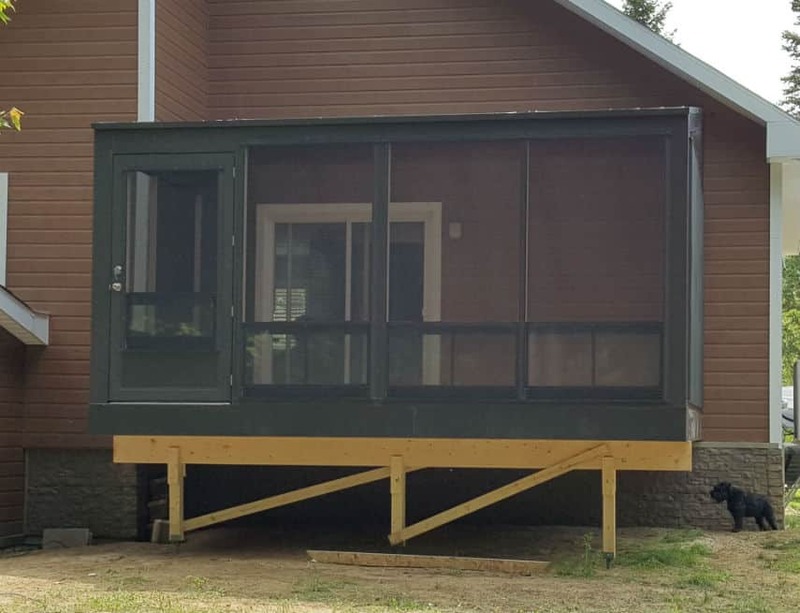 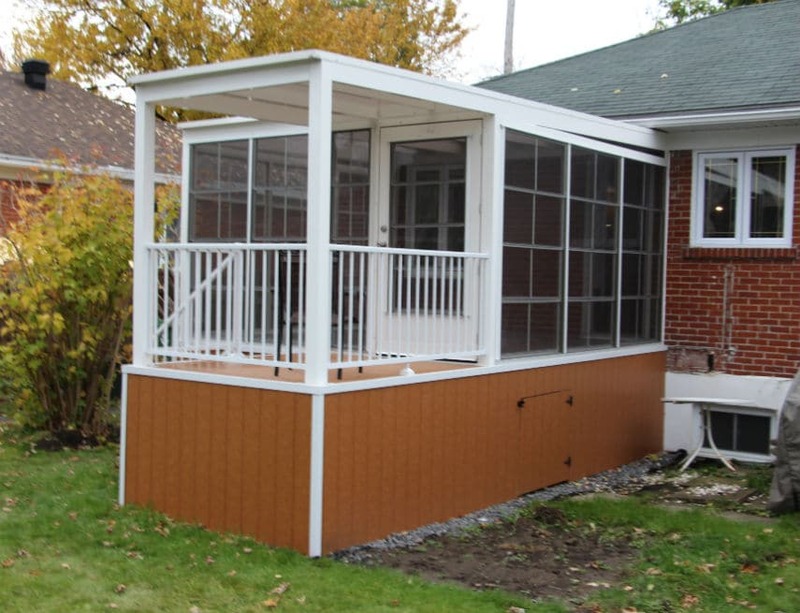 Our system is simple, sturdy and durable. 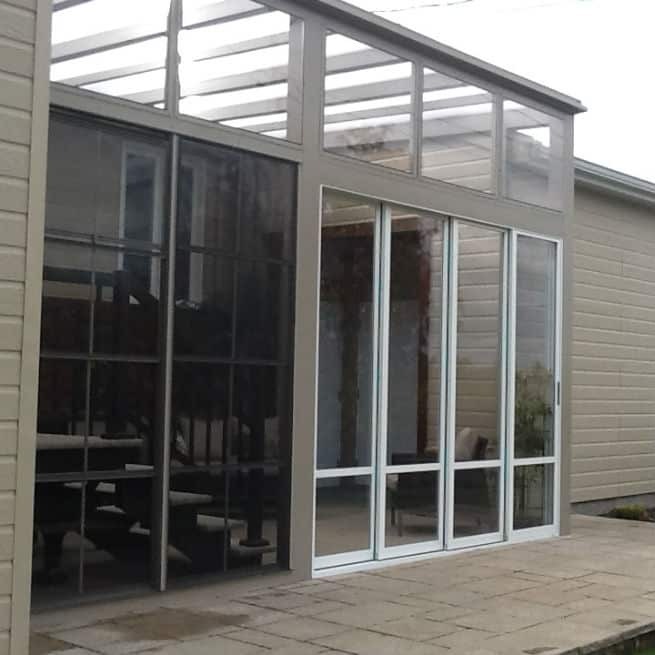 You can also choose horizontally sliding windows with fixed or detachable flyscreens. 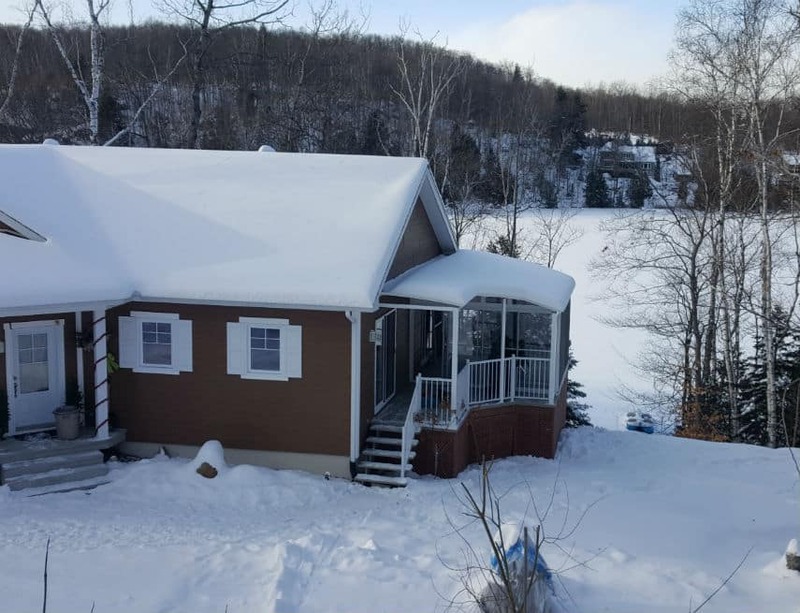 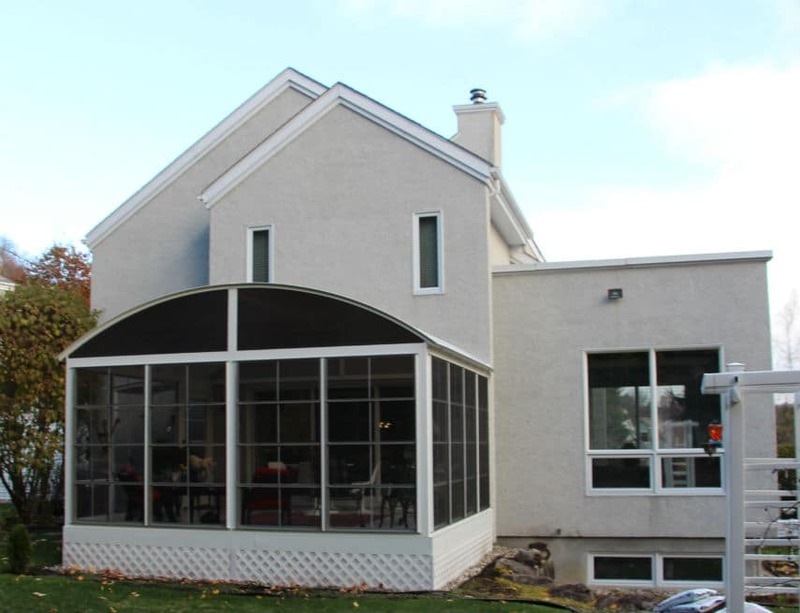 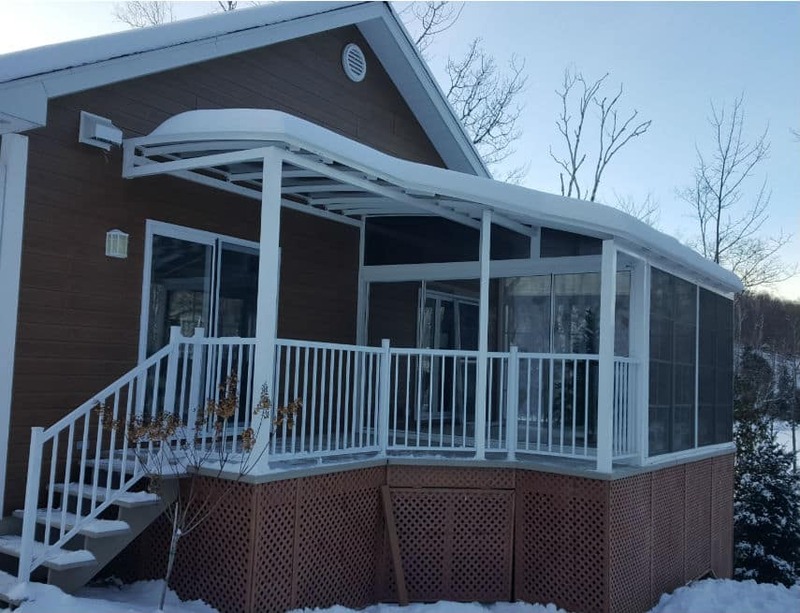 For a home with a low back cornice (often the case with a single-storey home), we provide a solution consisting of a sturdy roof that can be installed either flat or with a slight pitch while meeting the building code’s winter standards. 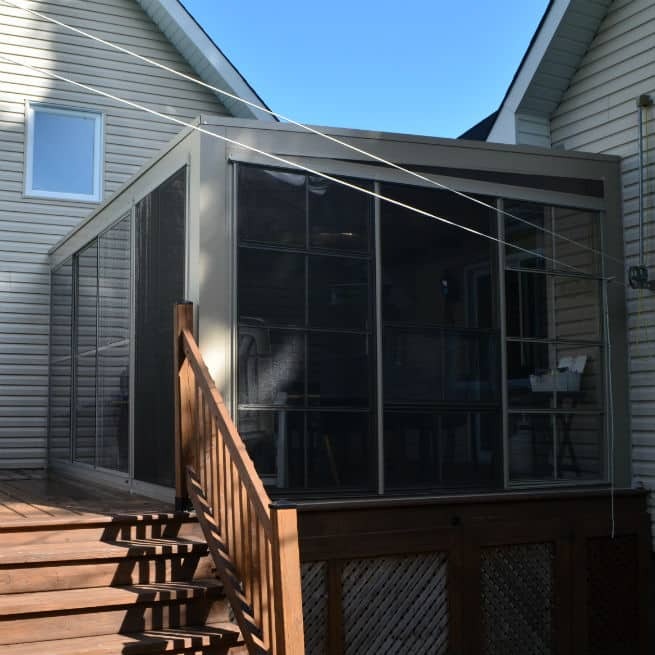 You will thereby maintain a minimum of 78” in height at the front of your solarium. 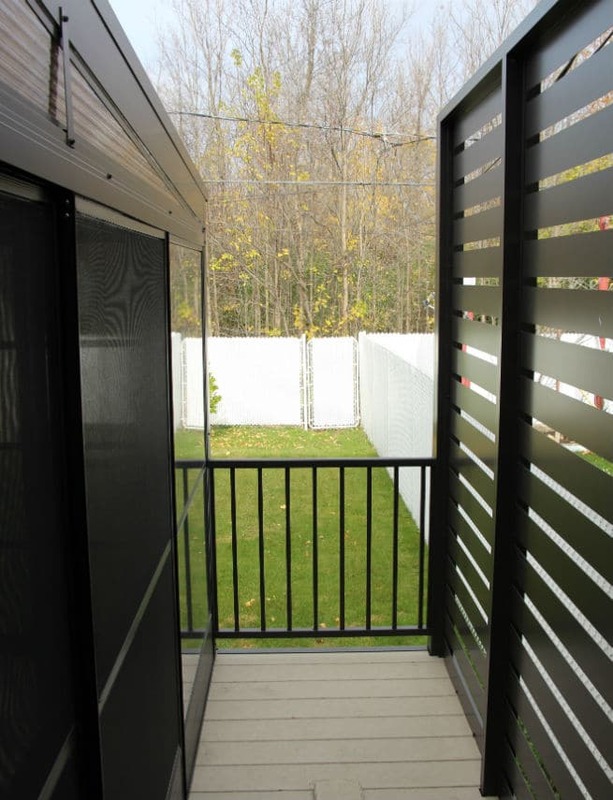 …AND FOR THOSE WHO HAVE A LITTLE LESS. 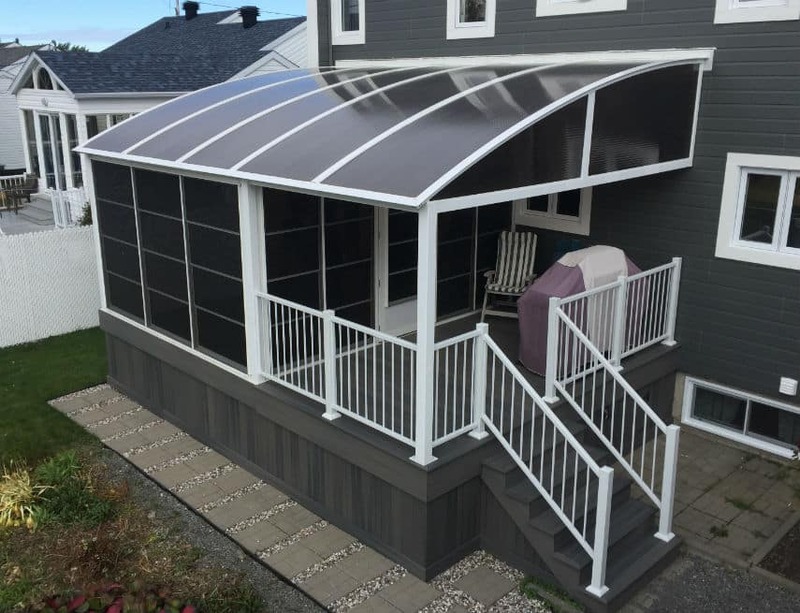 season veranda model is ideal. 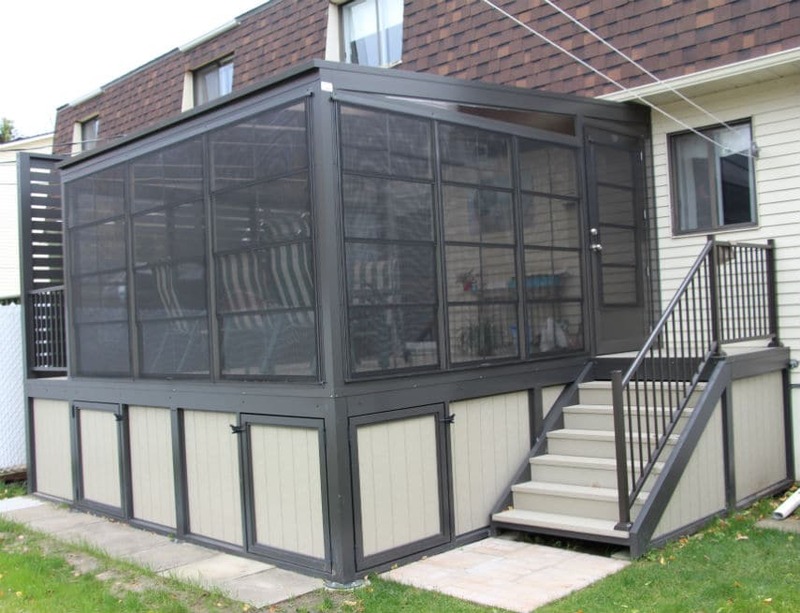 We will build you a shelter with the ideal height for you. 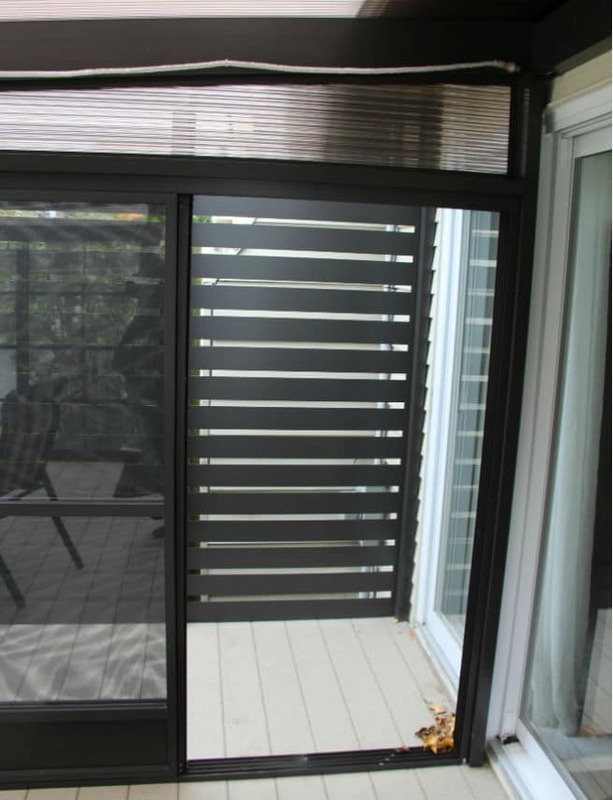 Depending on your needs, decorative panels that provide privacy and personality can be added. 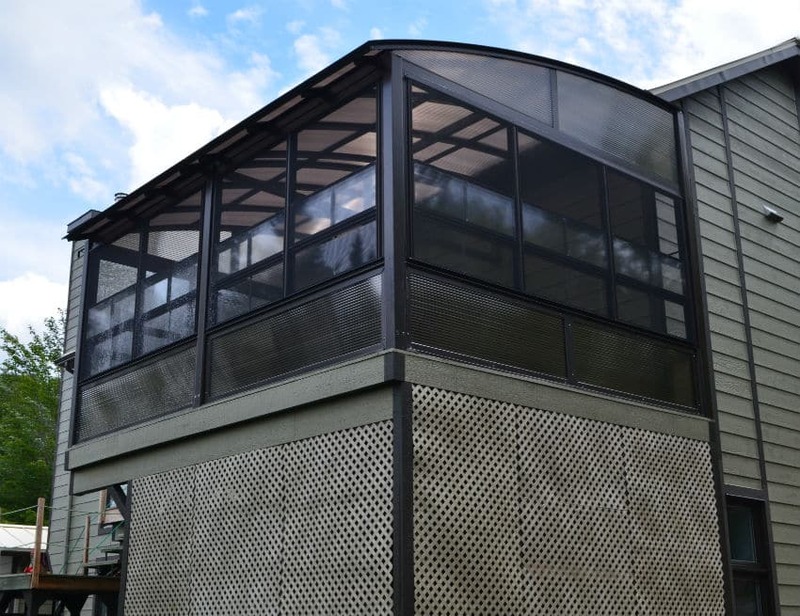 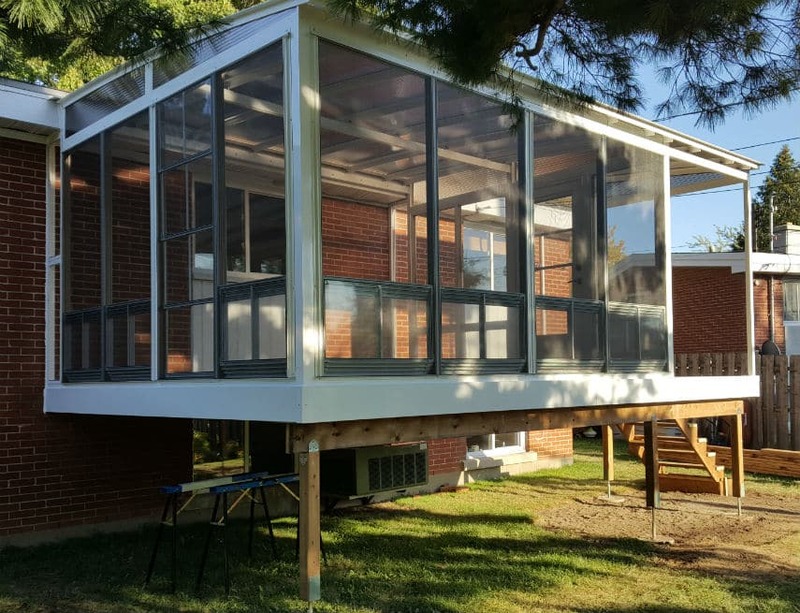 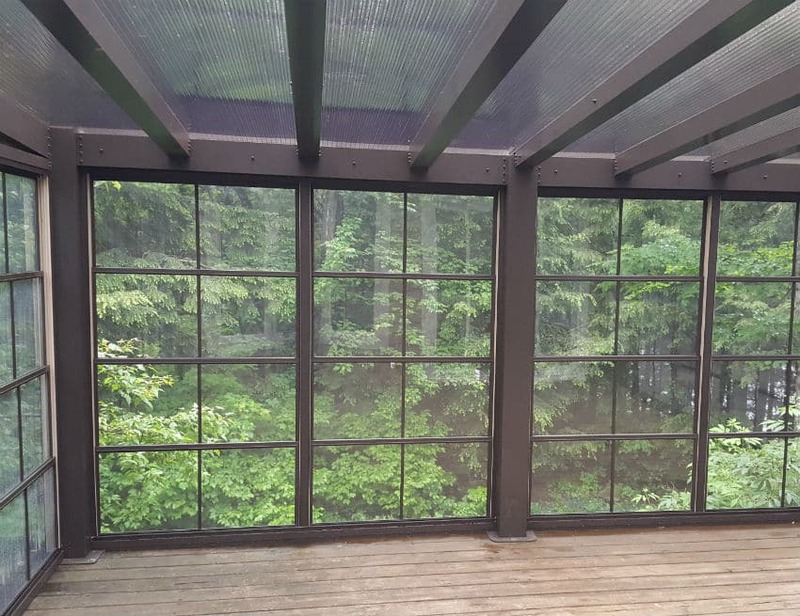 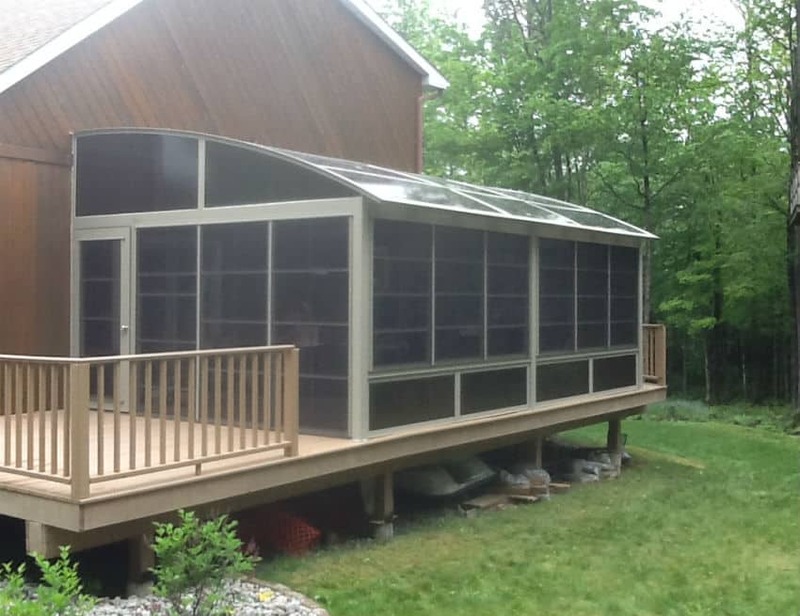 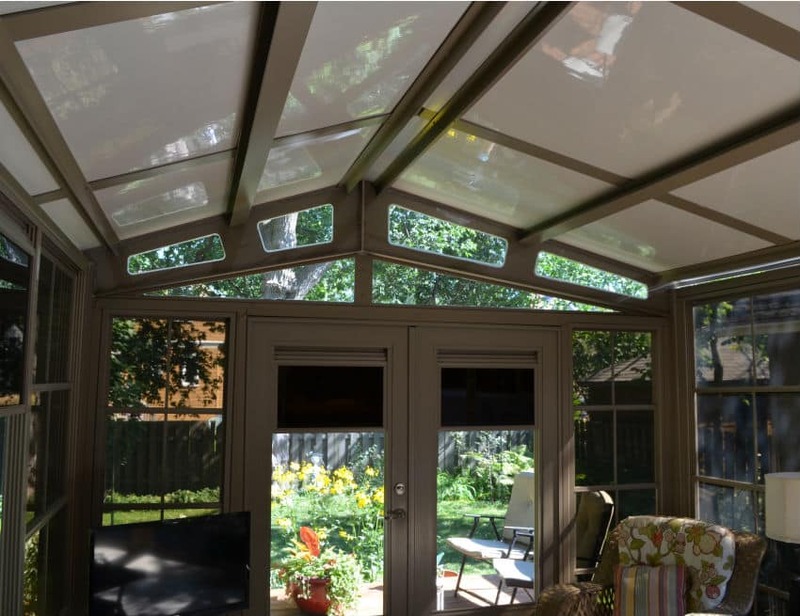 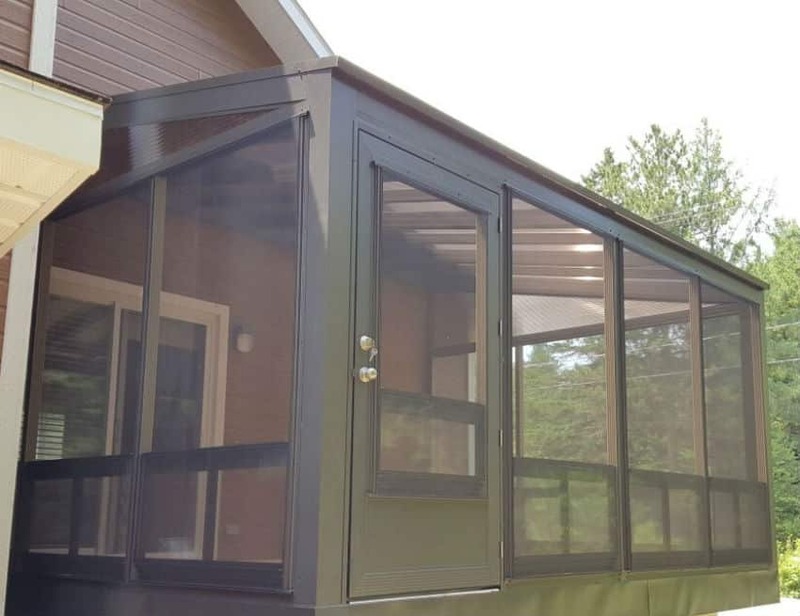 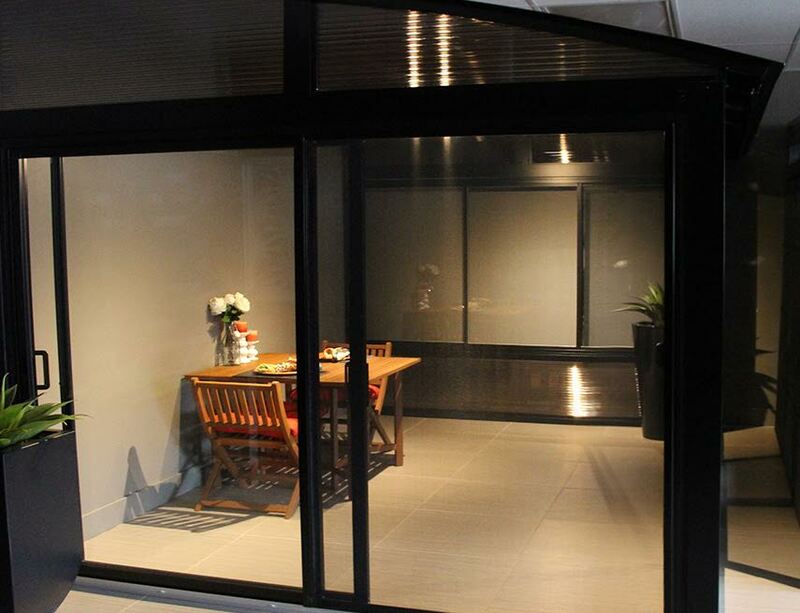 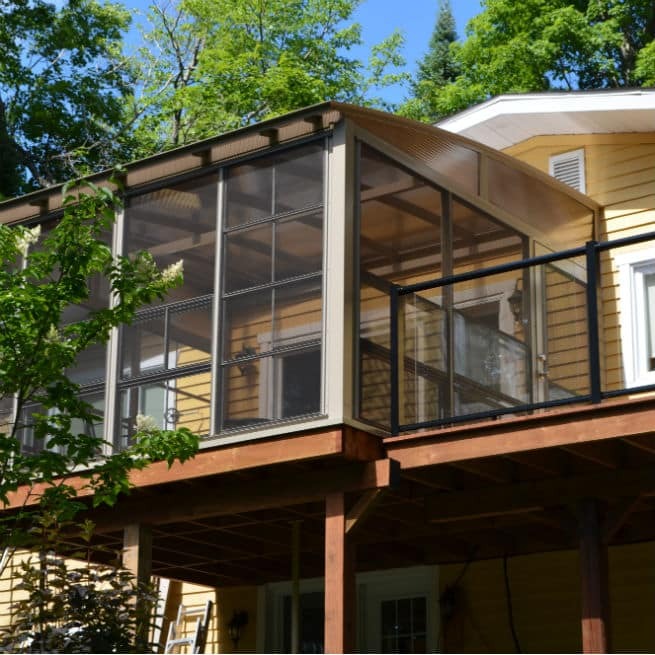 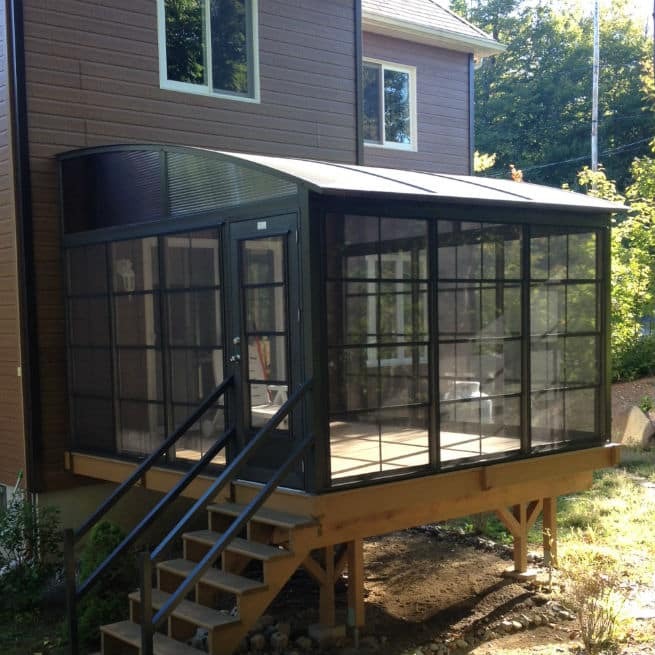 Low walls, custom-built to meet your needs and requirements, can easily be installed on a Tendal solarium. 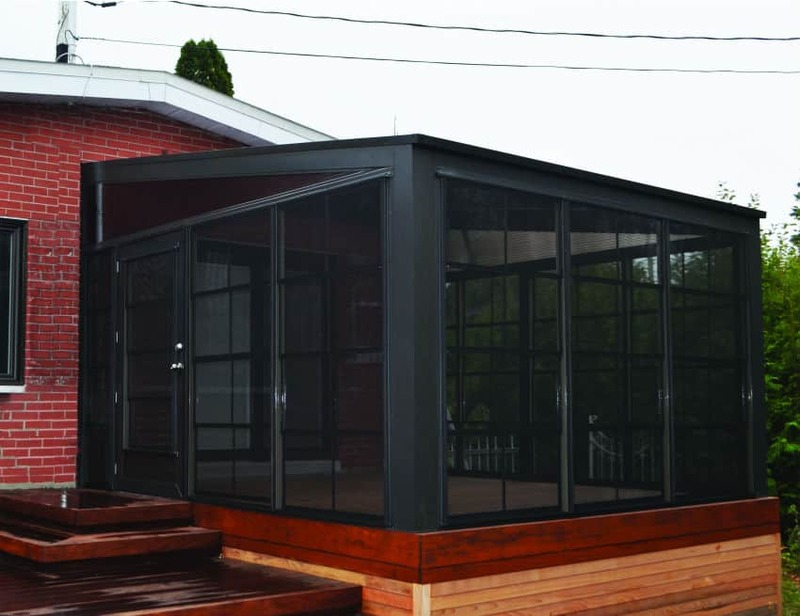 Whether of sheet metal, polycarbonate or PVC construction, they will prove highly useful. 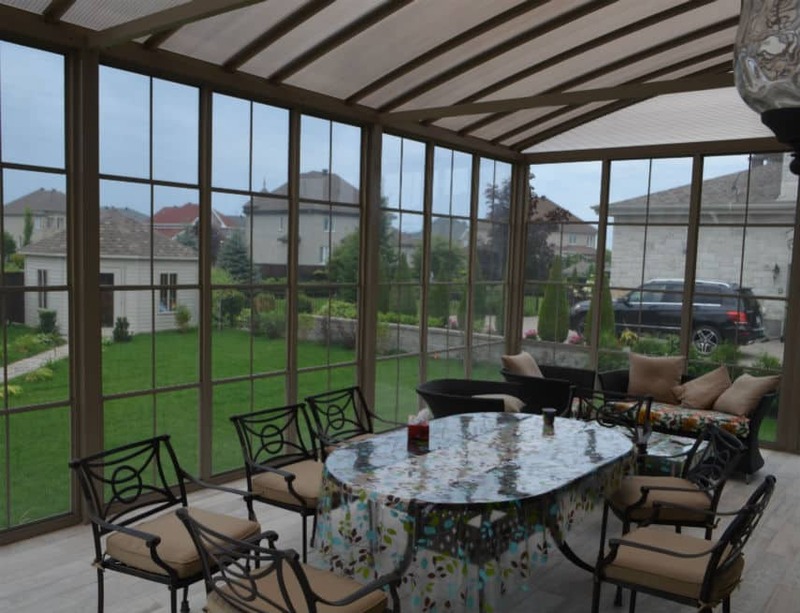 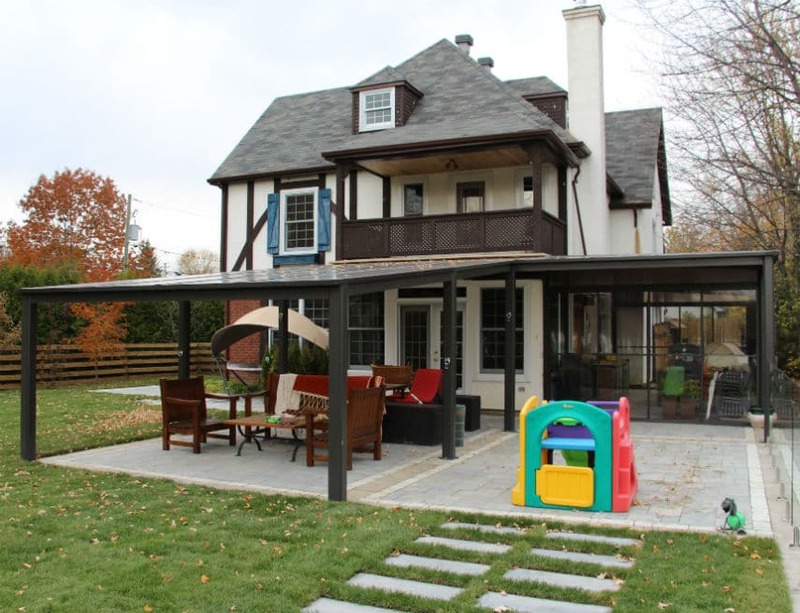 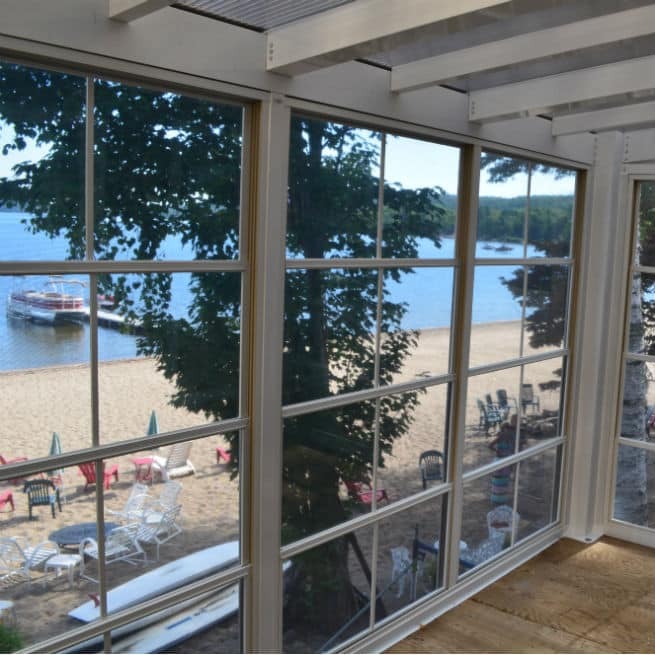 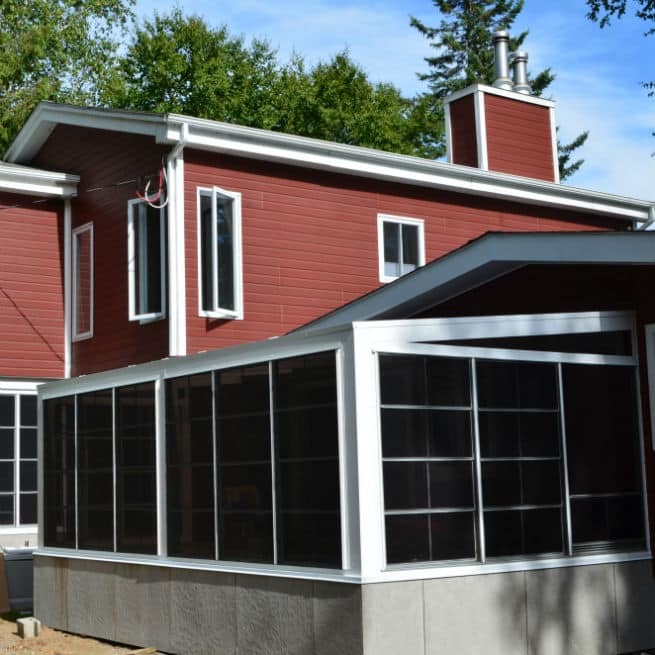 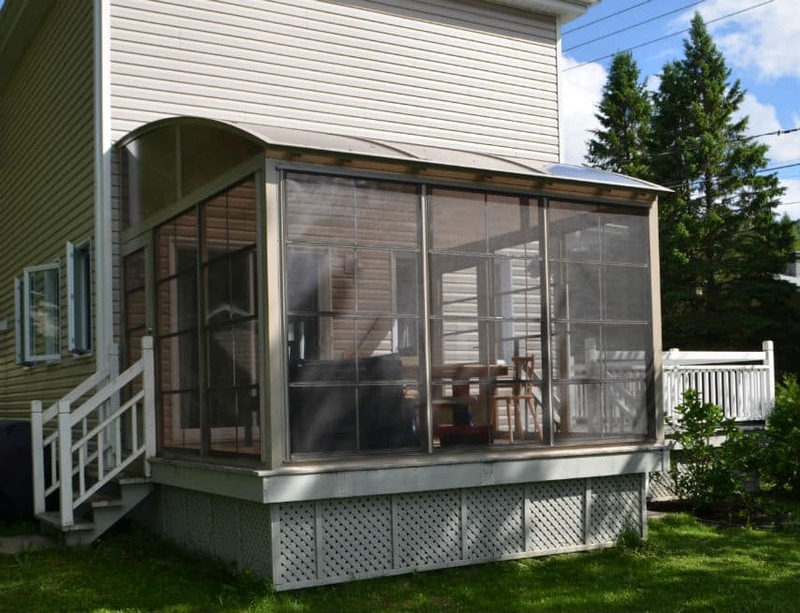 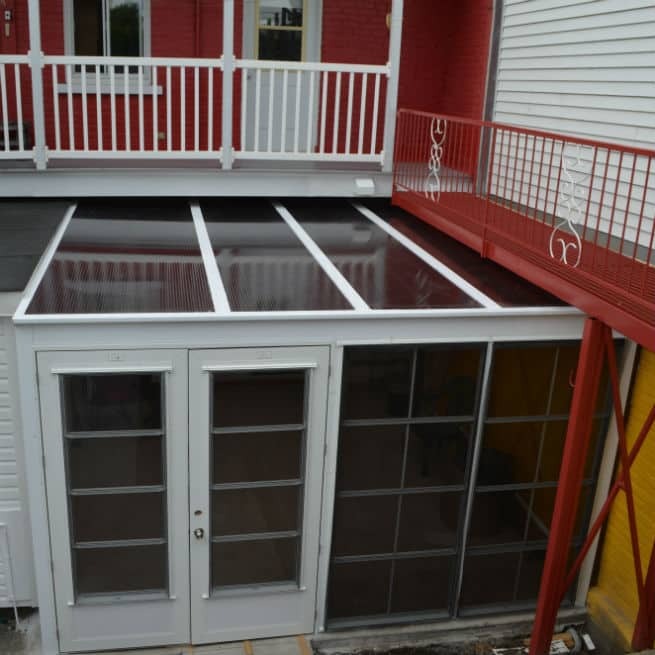 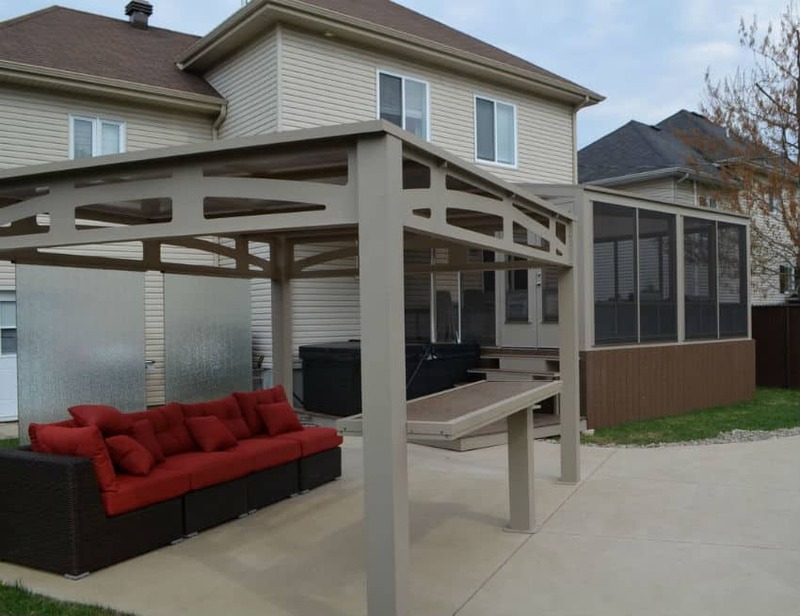 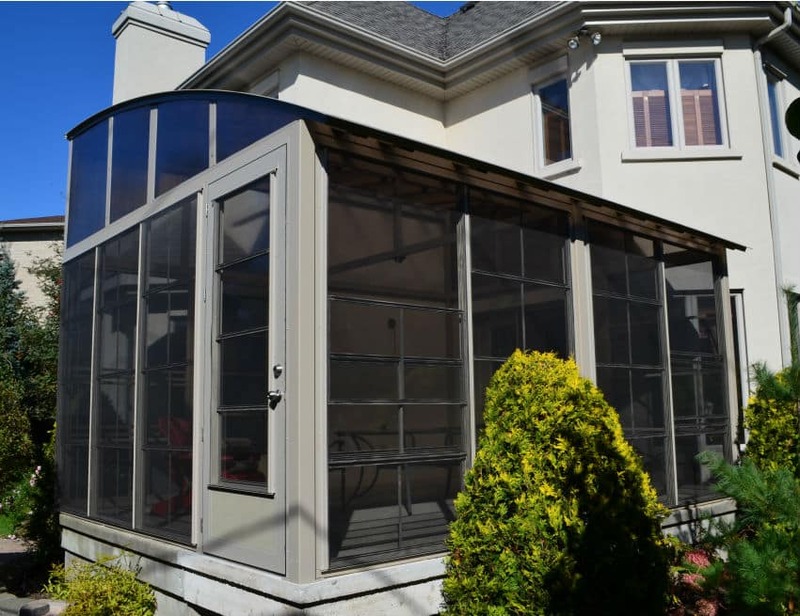 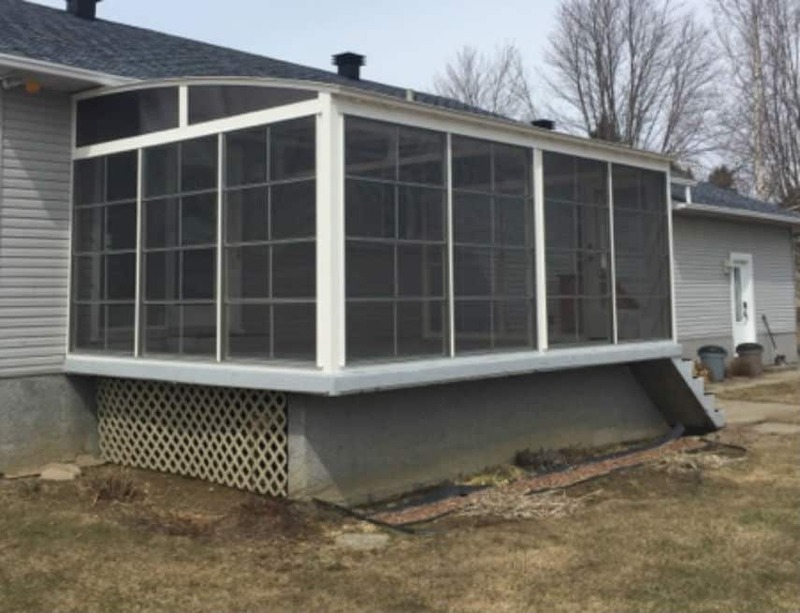 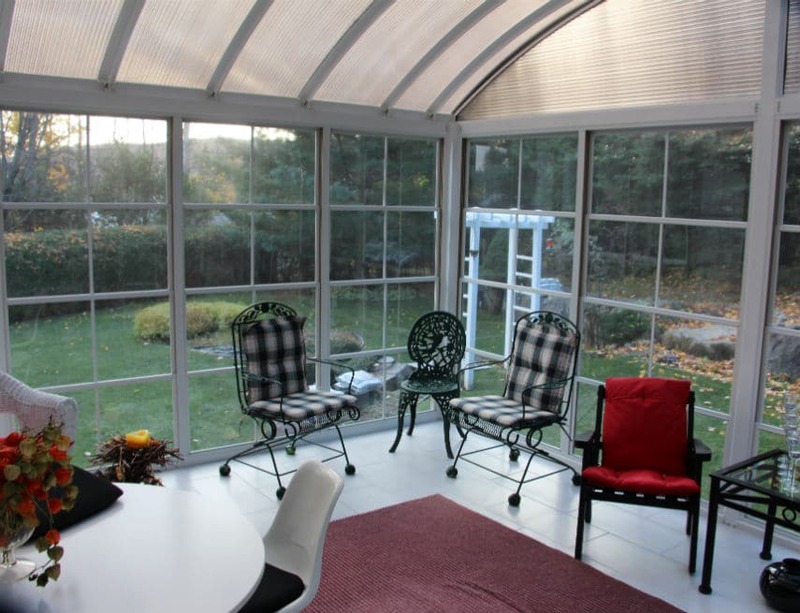 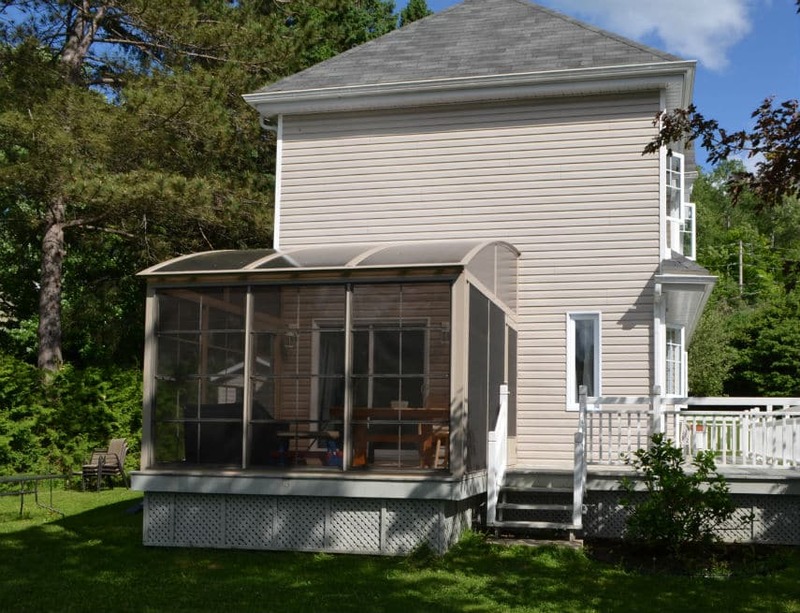 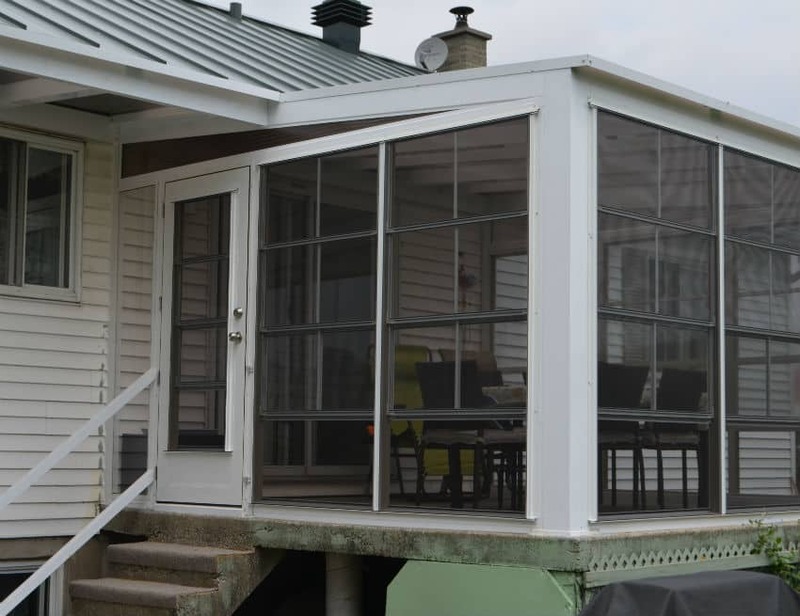 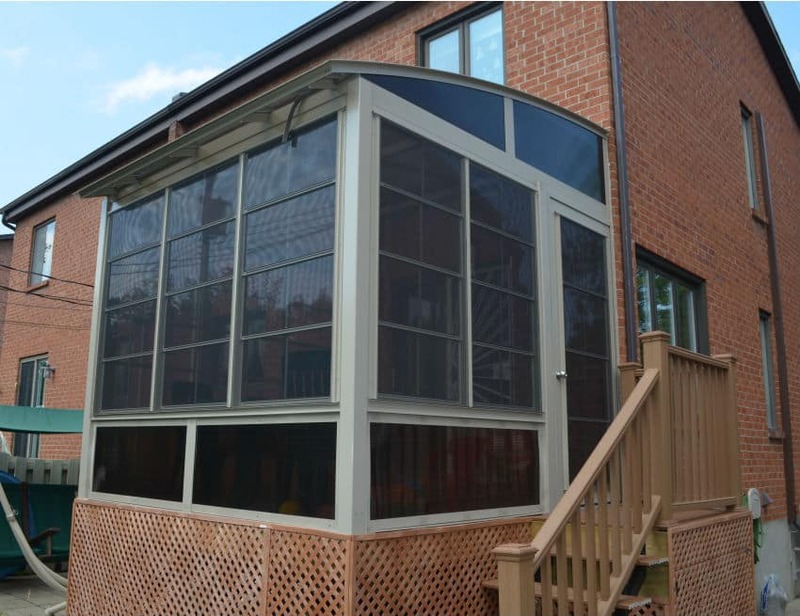 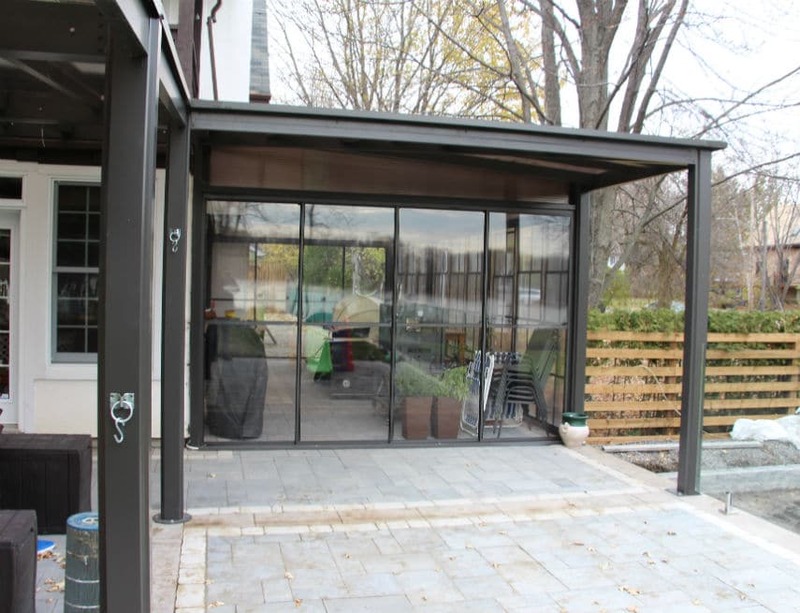 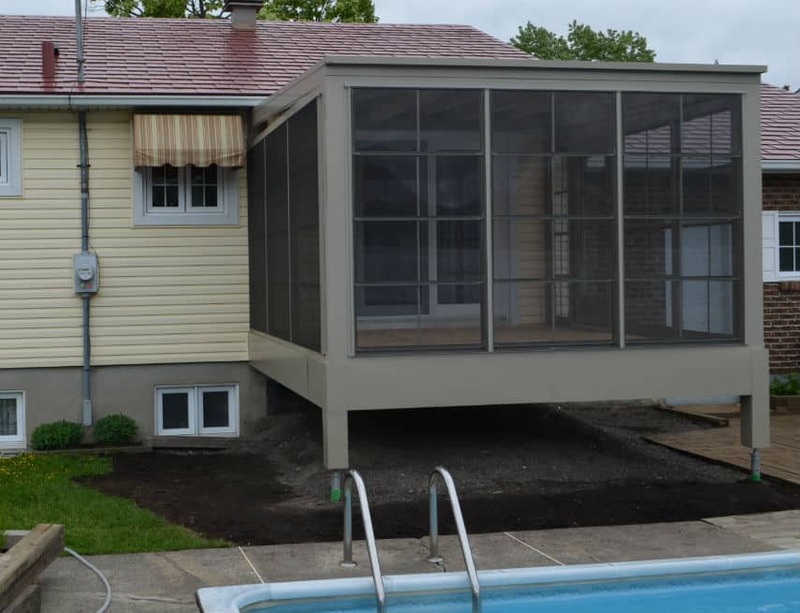 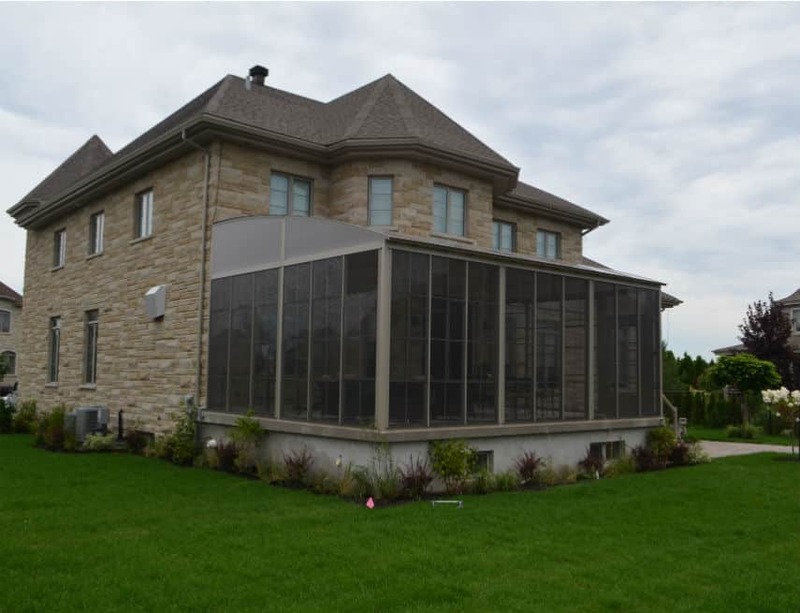 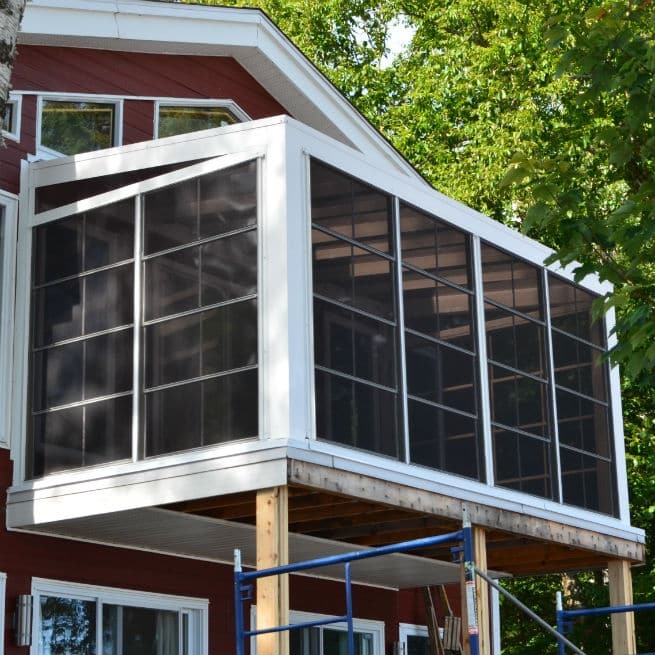 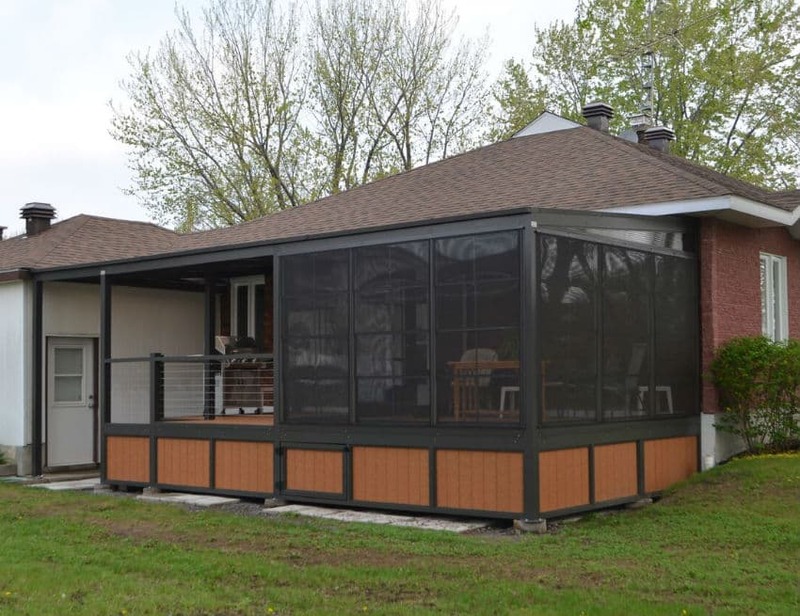 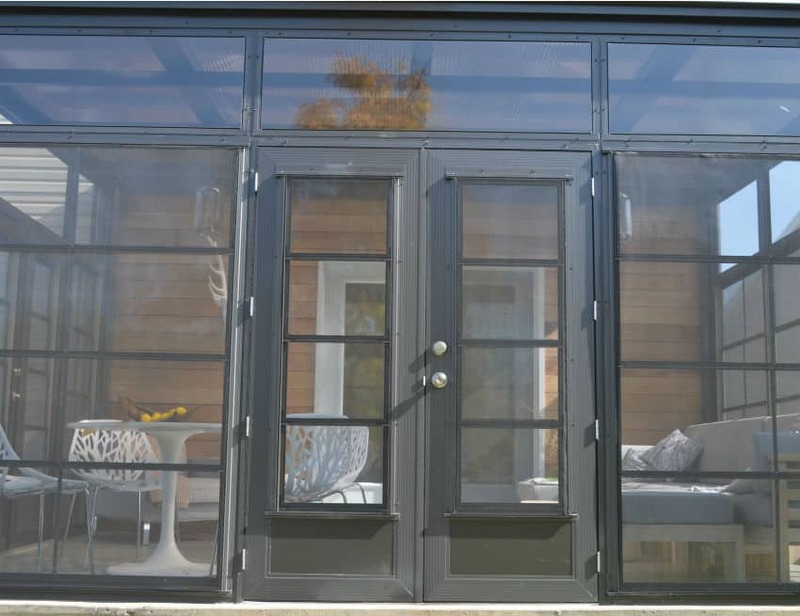 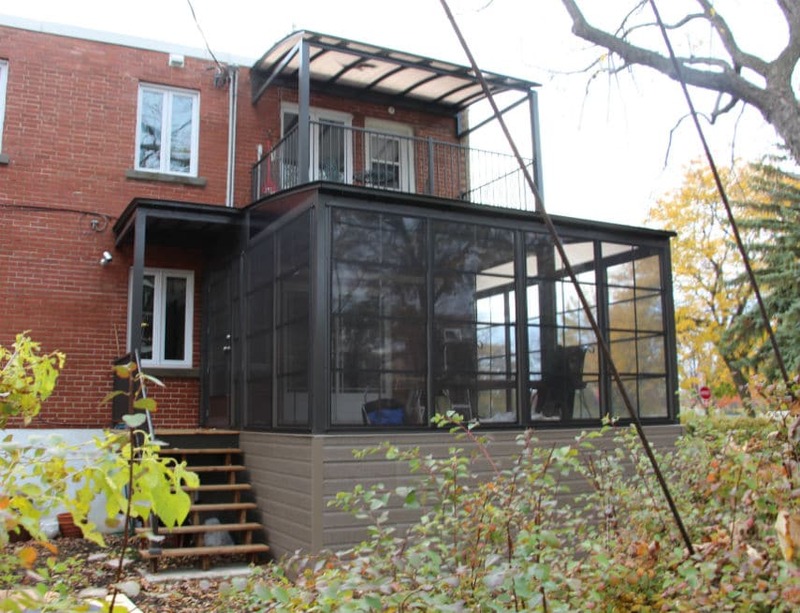 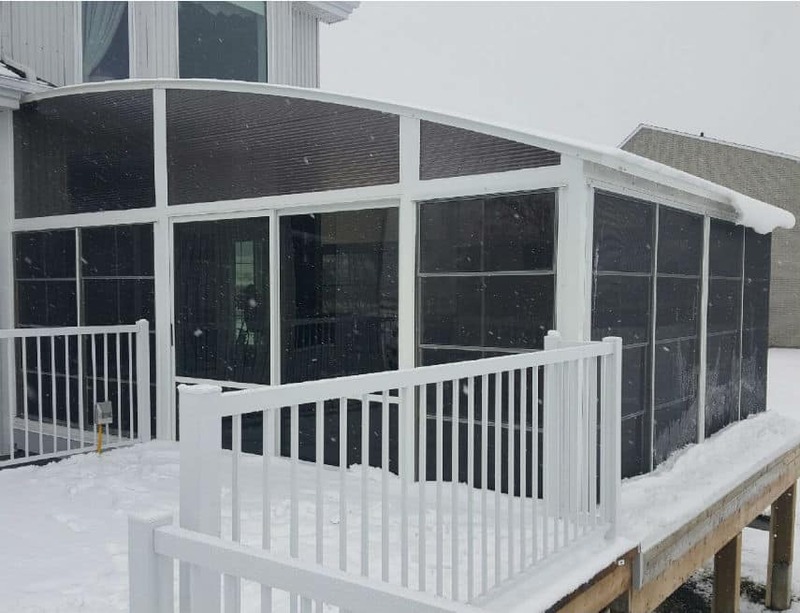 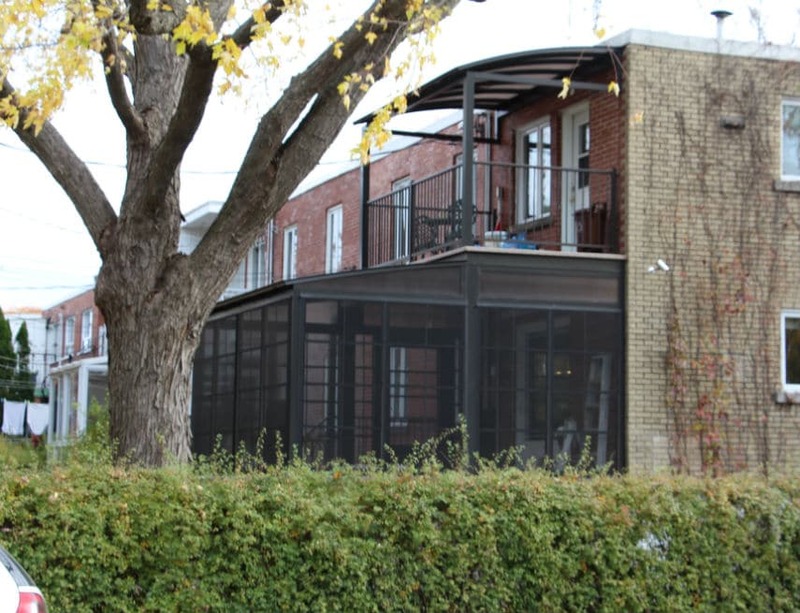 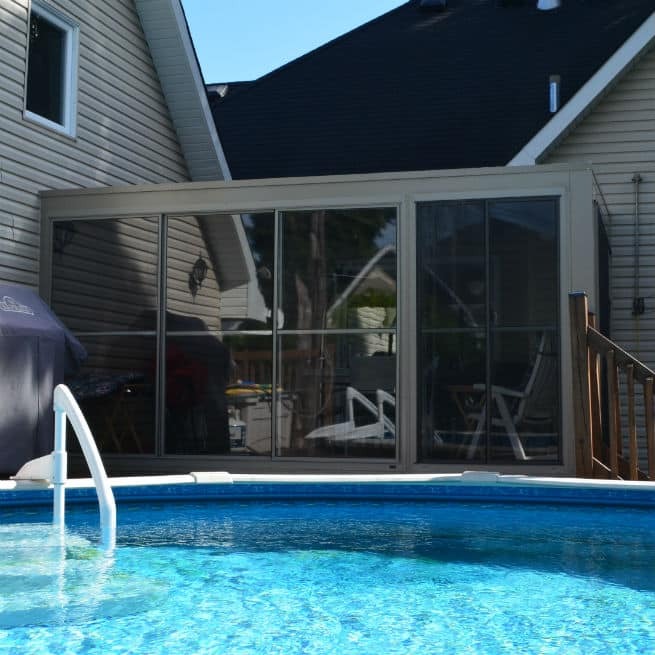 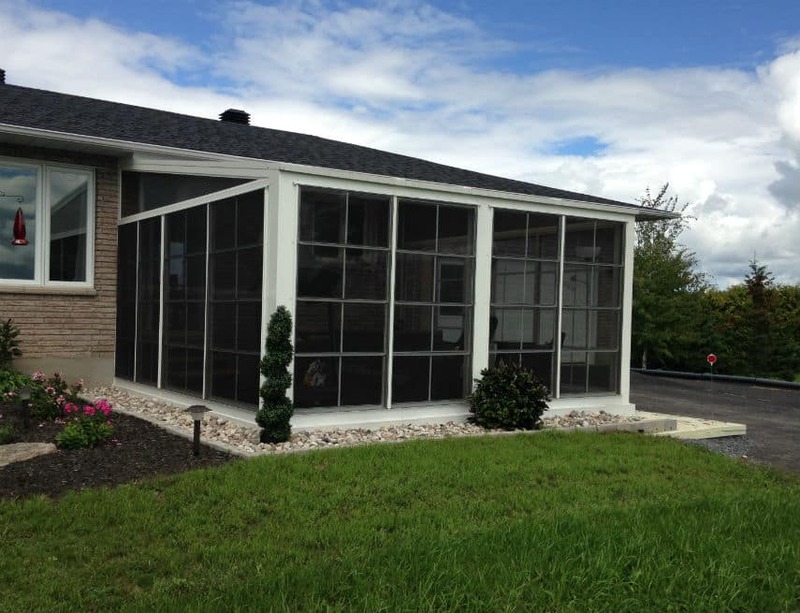 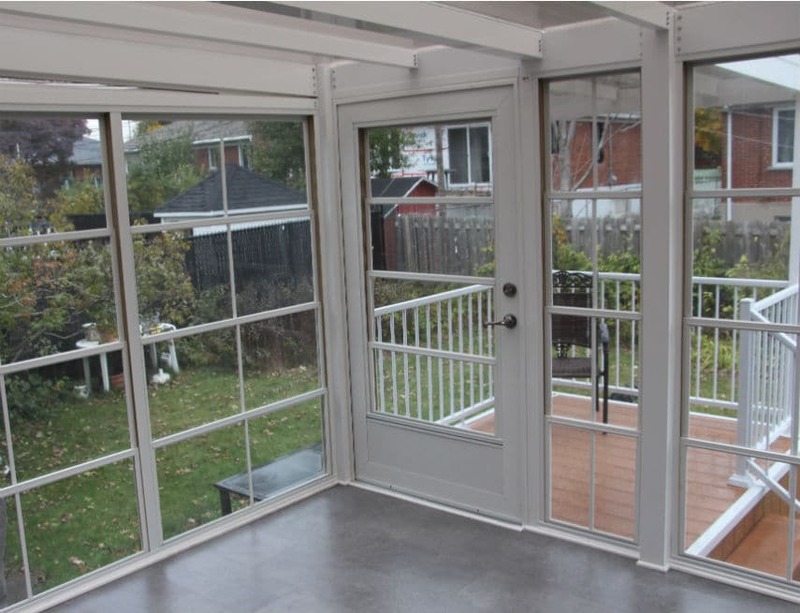 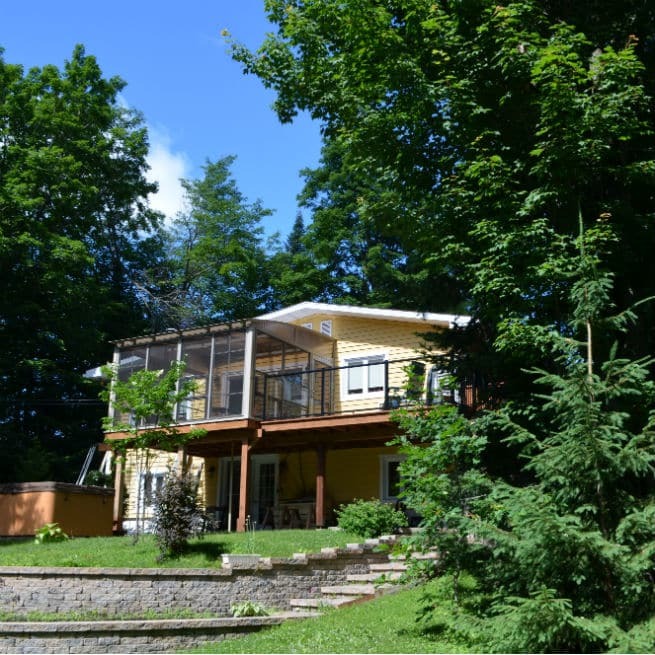 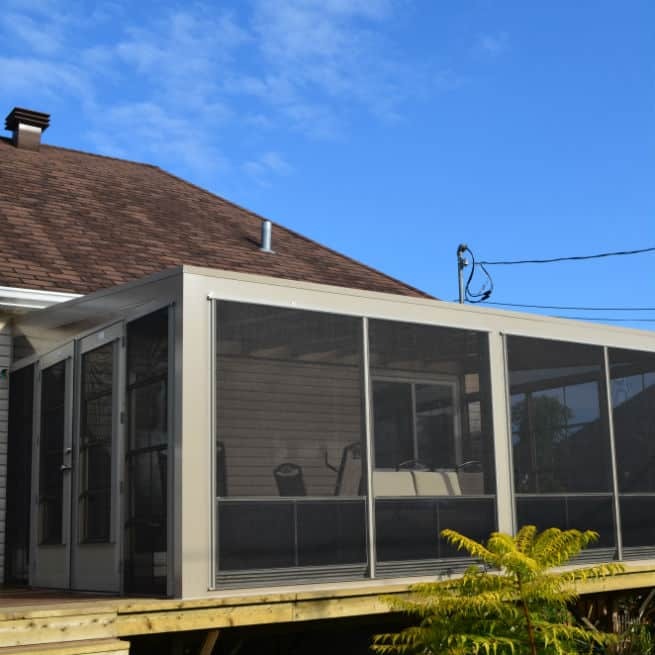 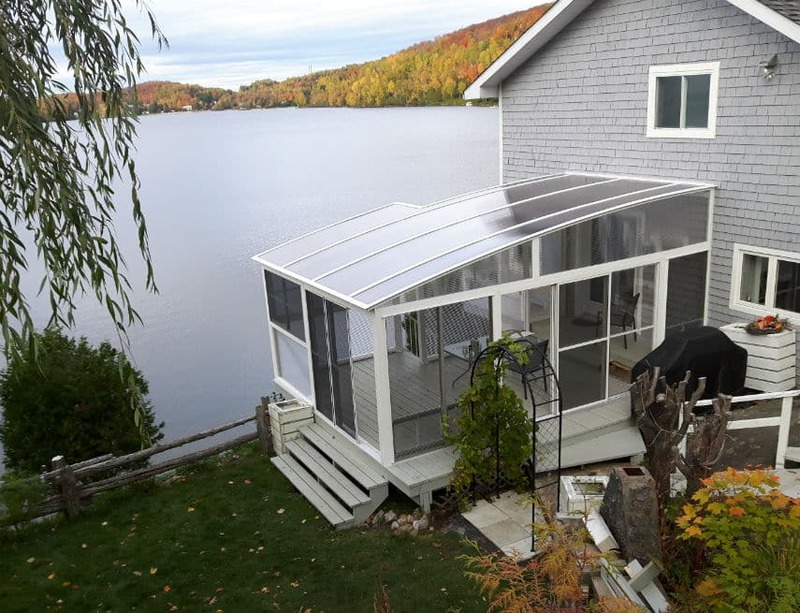 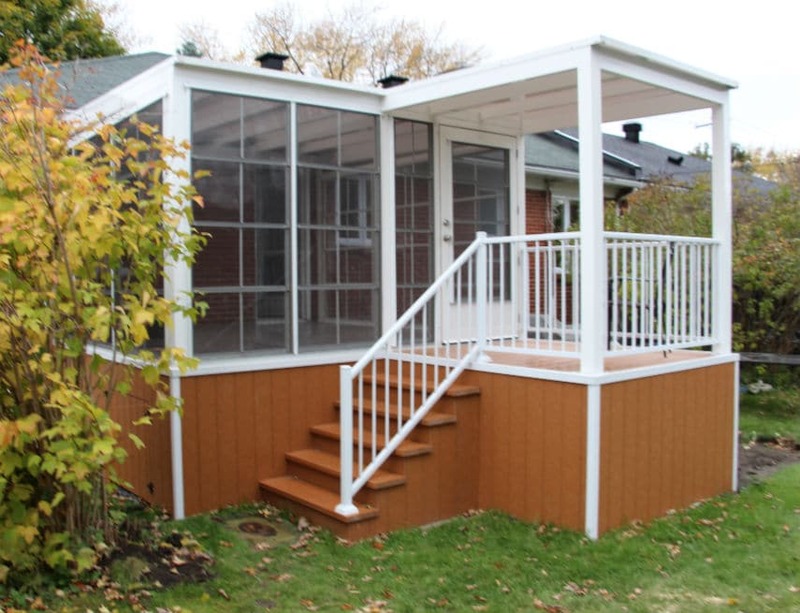 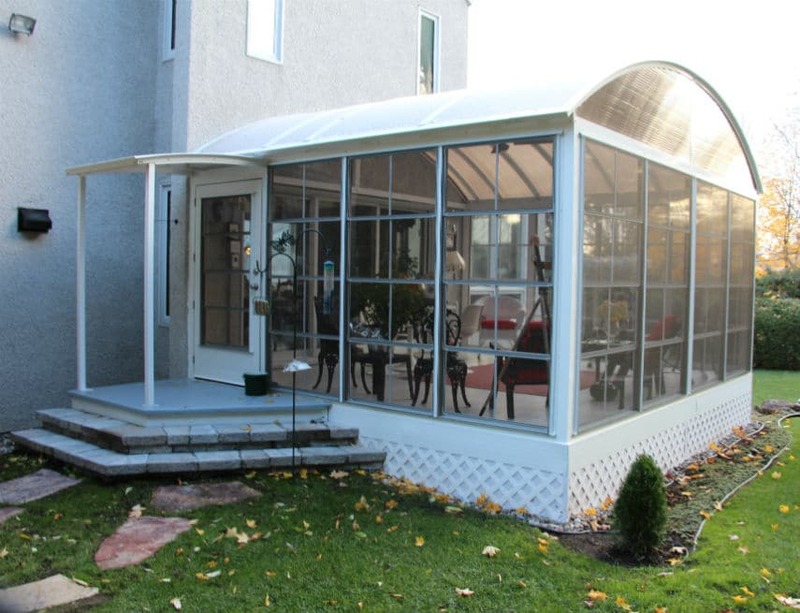 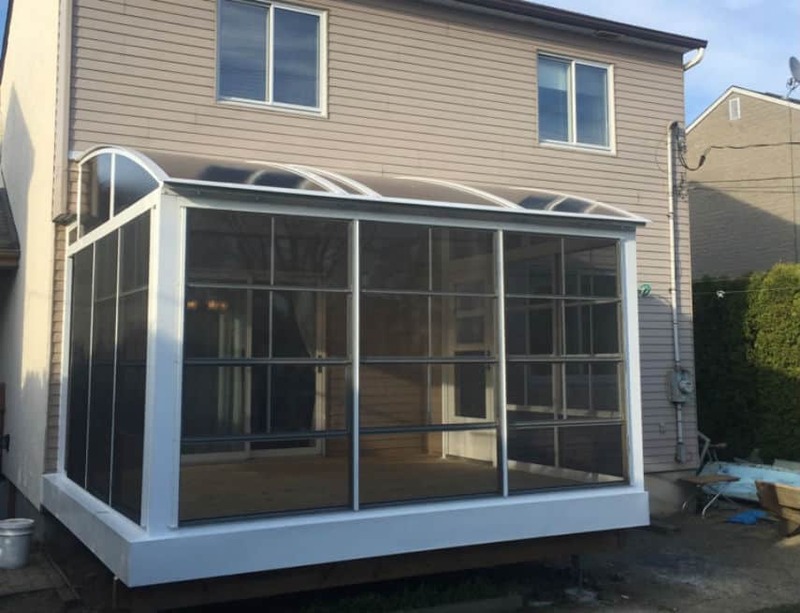 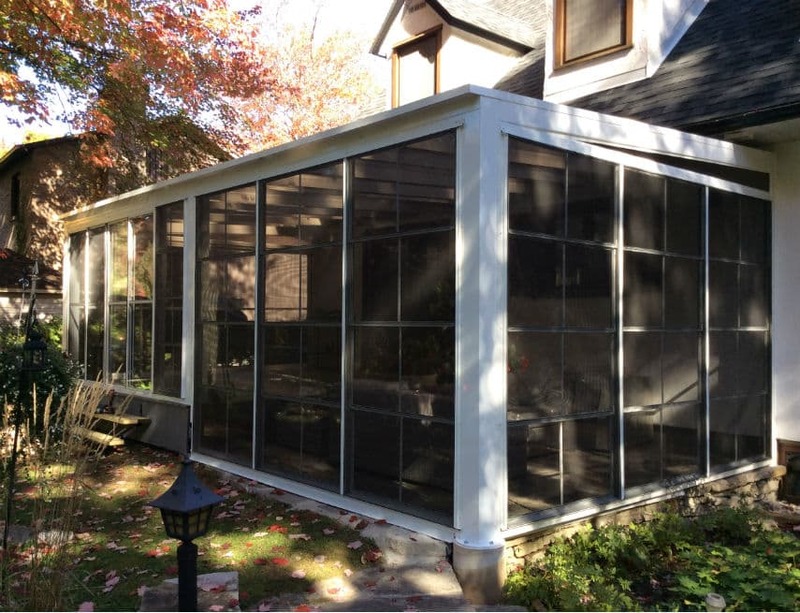 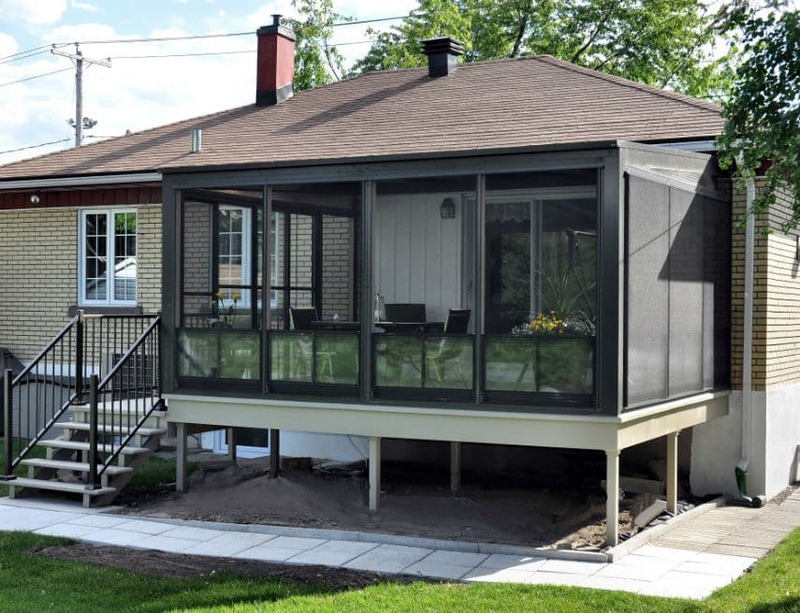 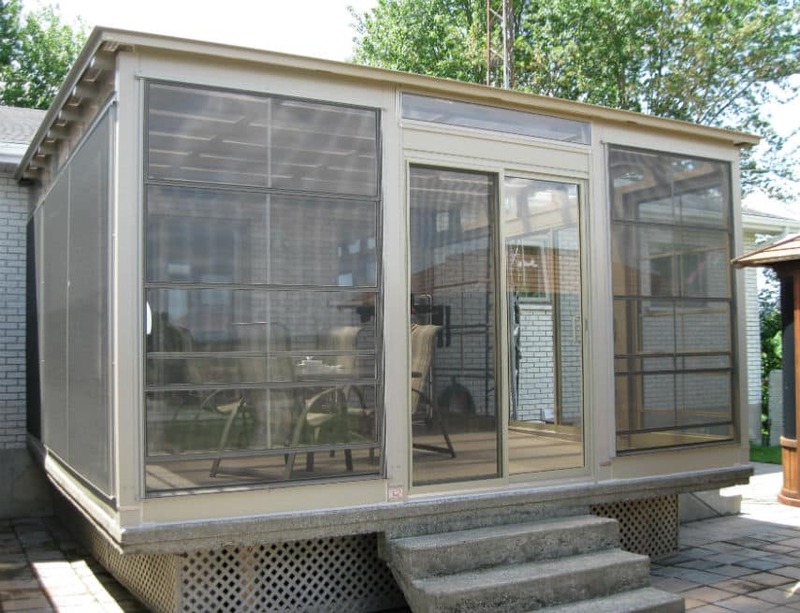 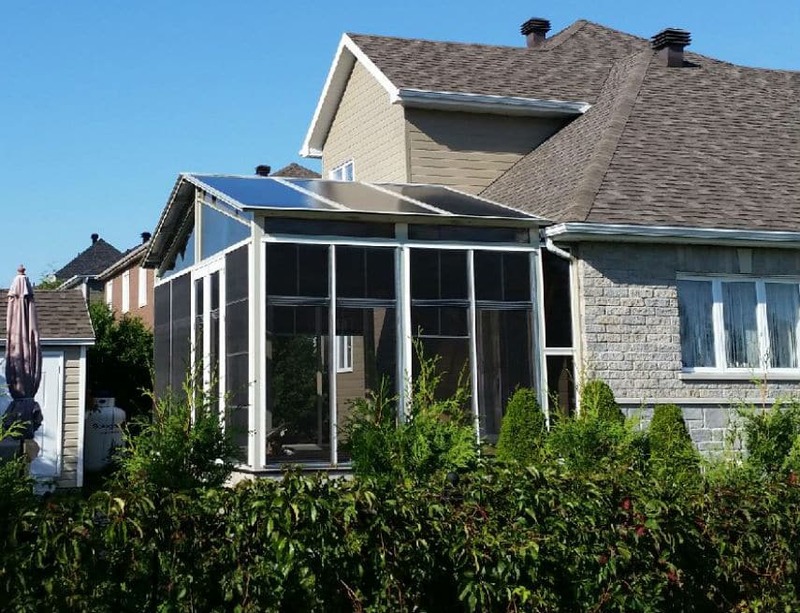 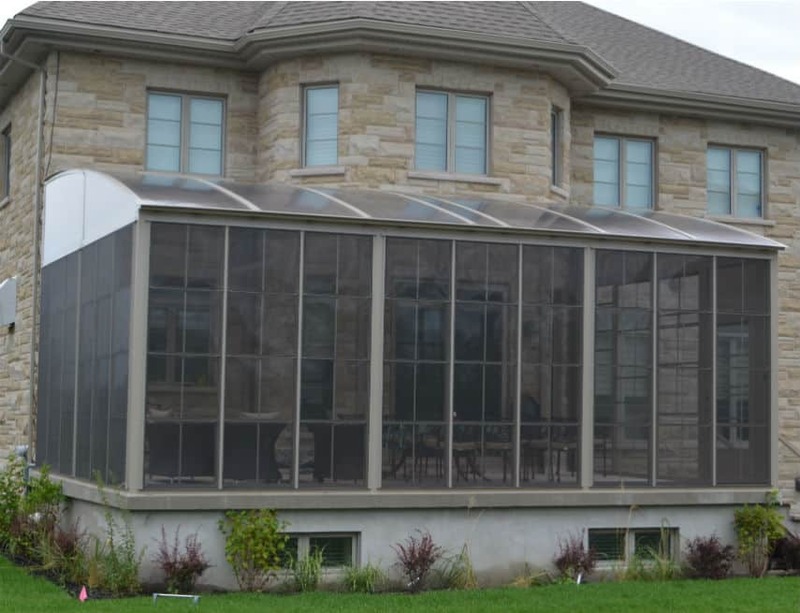 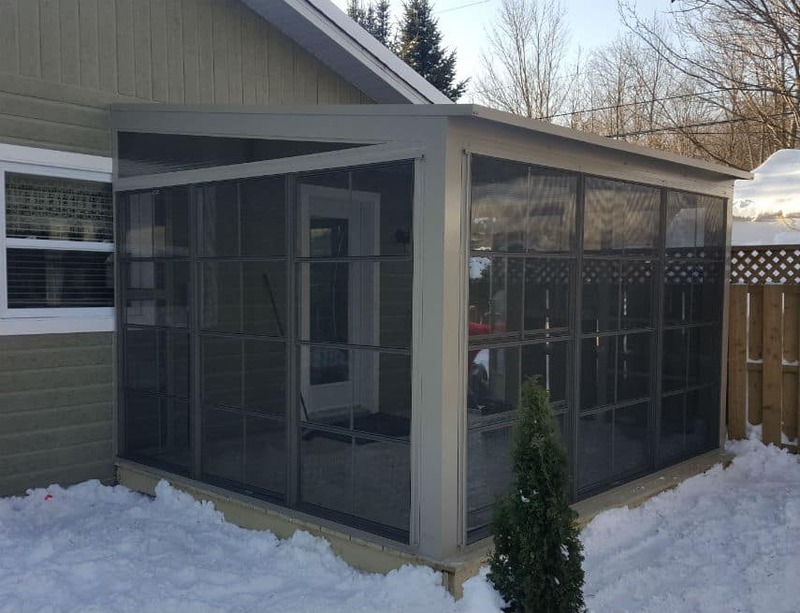 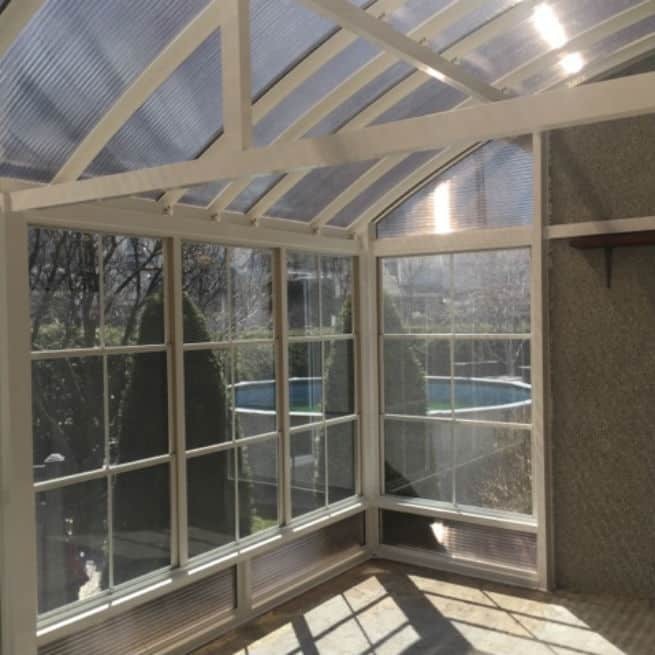 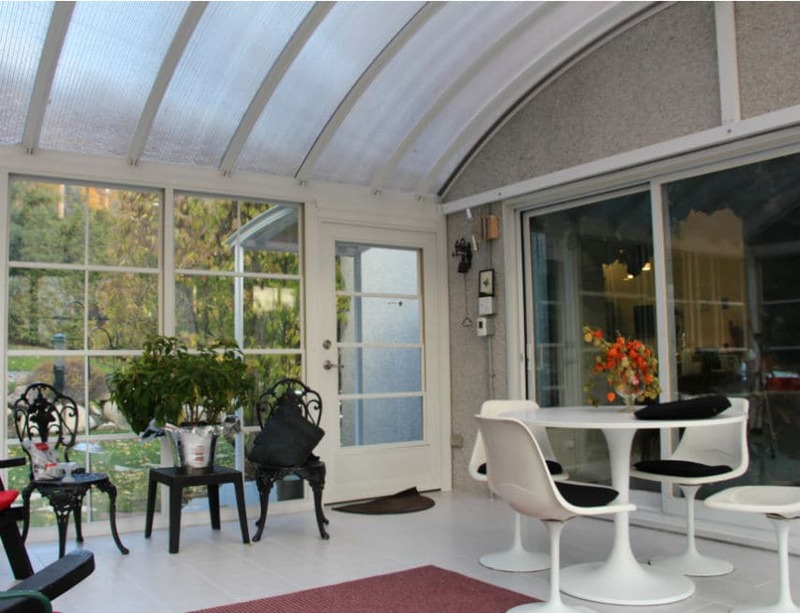 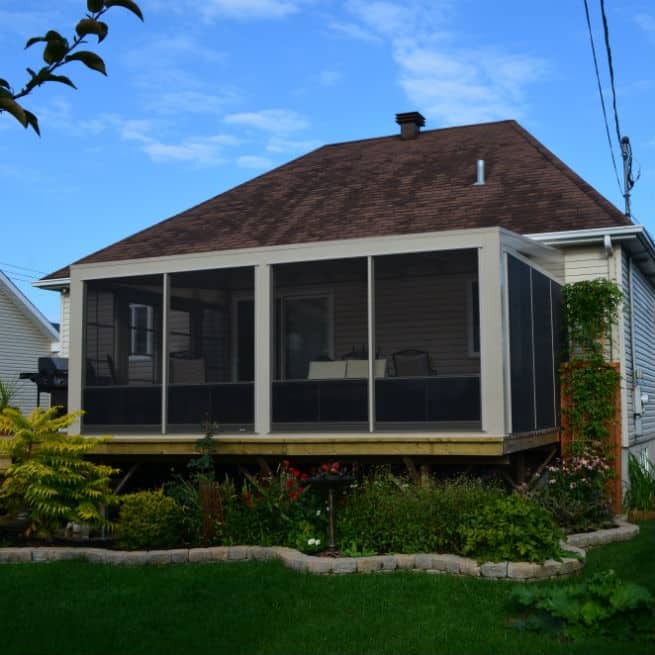 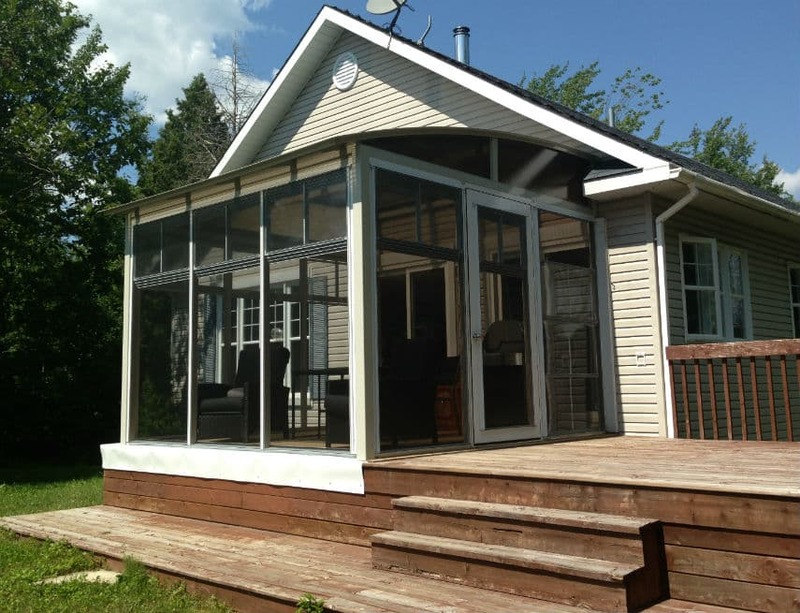 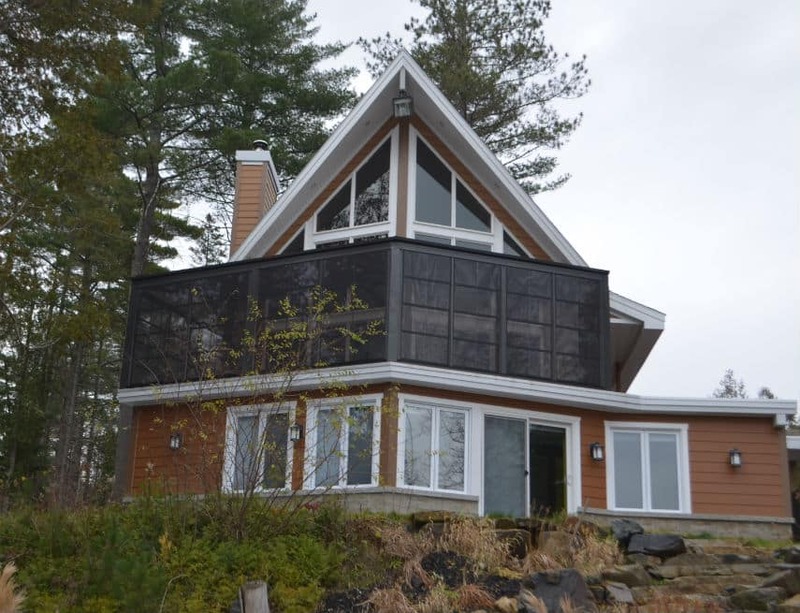 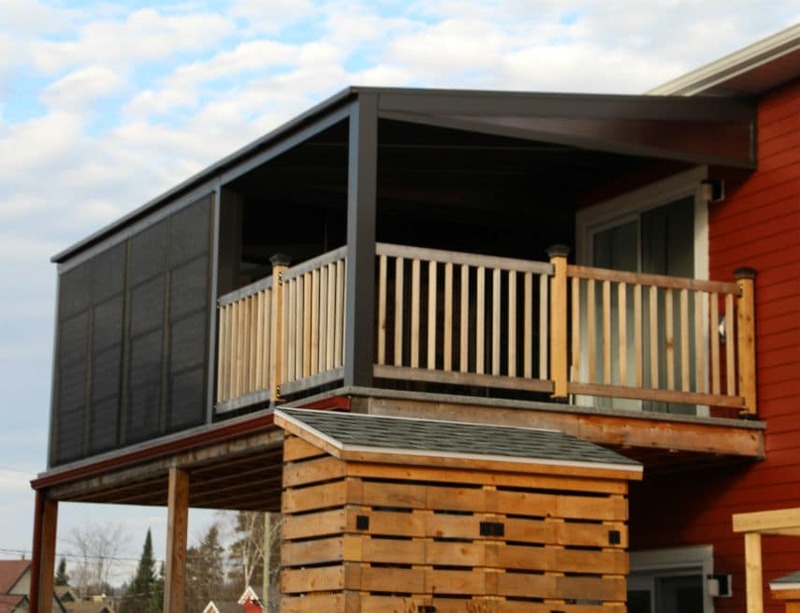 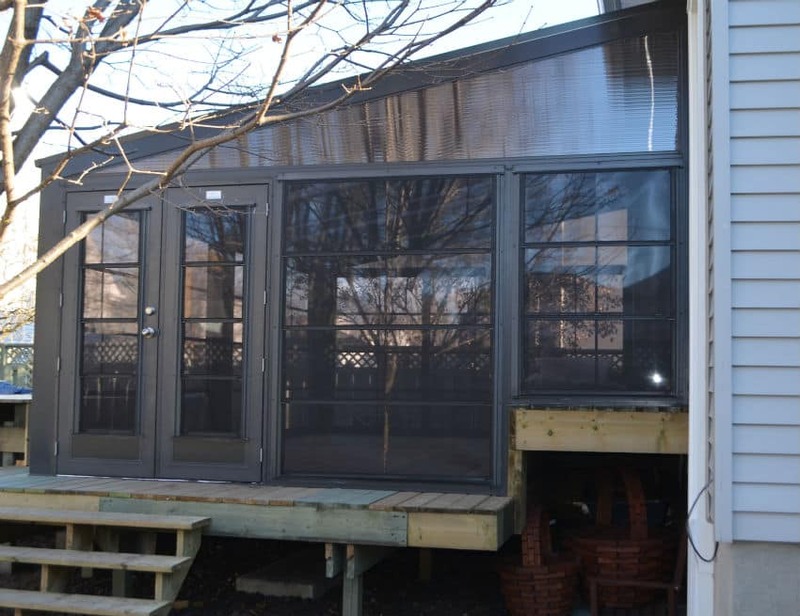 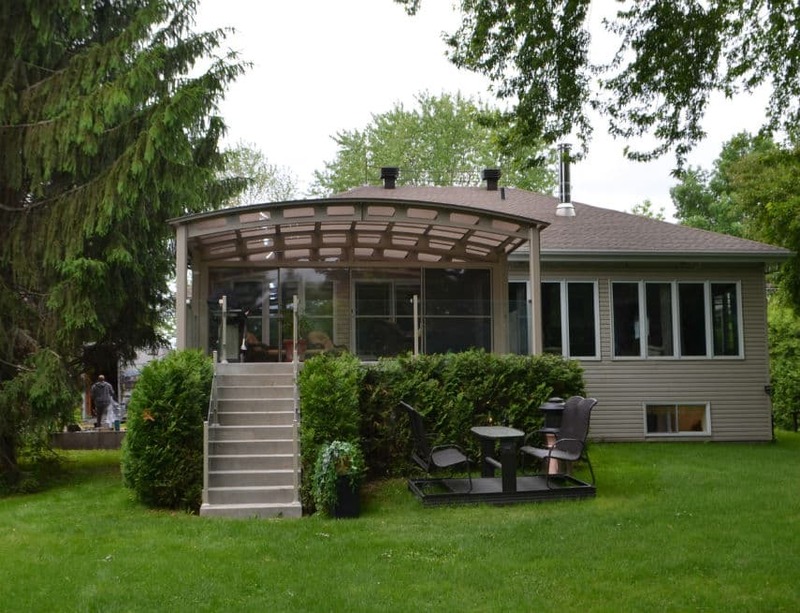 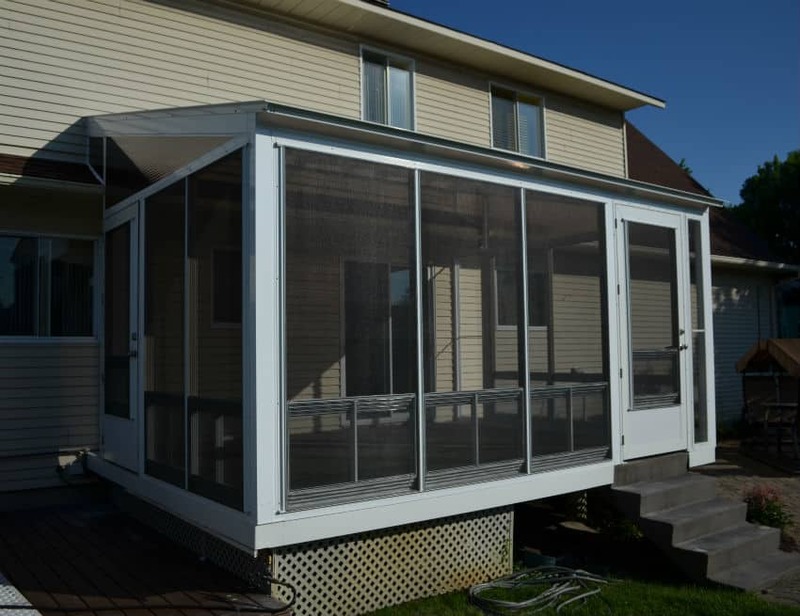 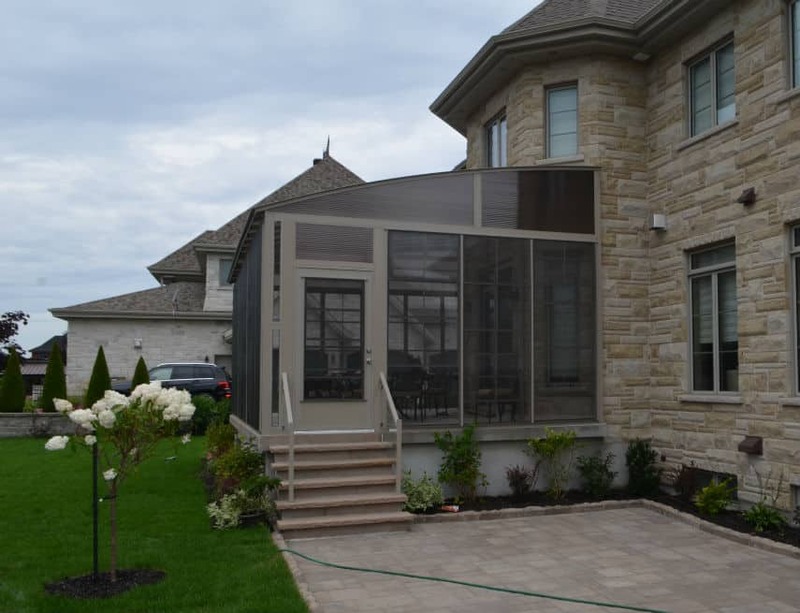 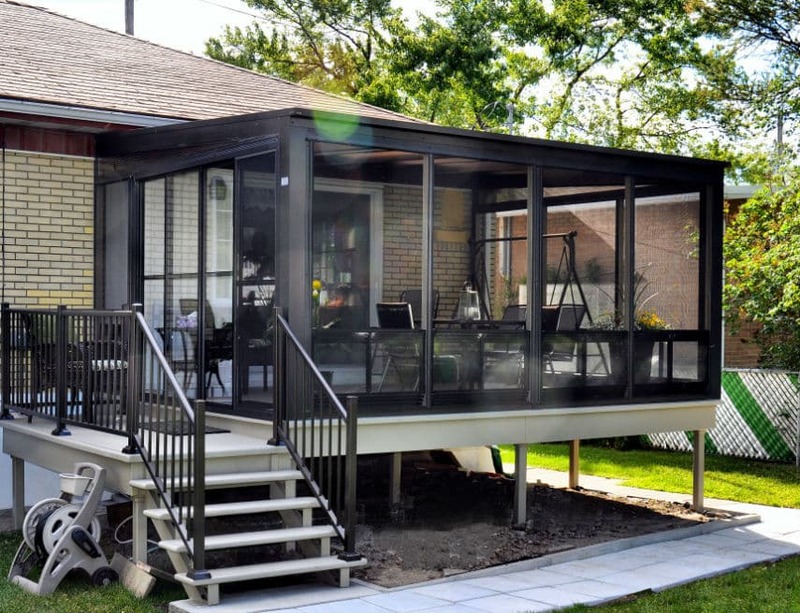 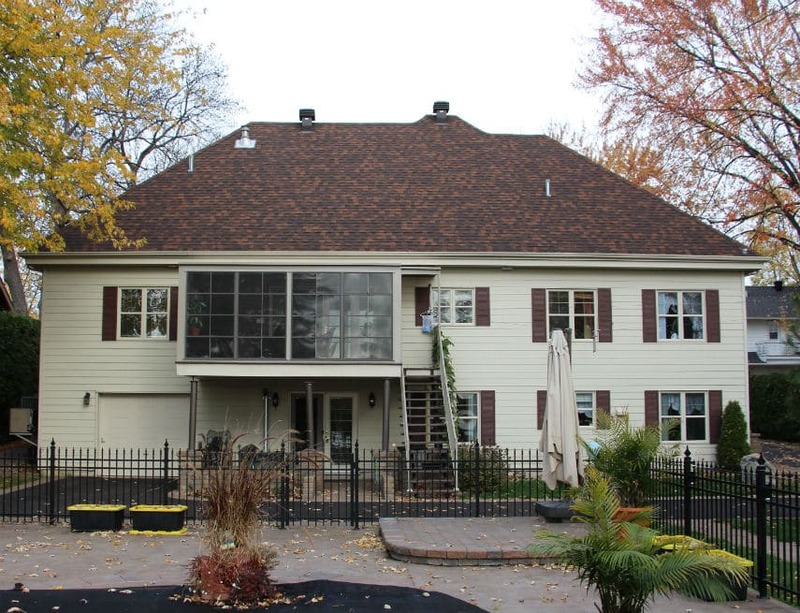 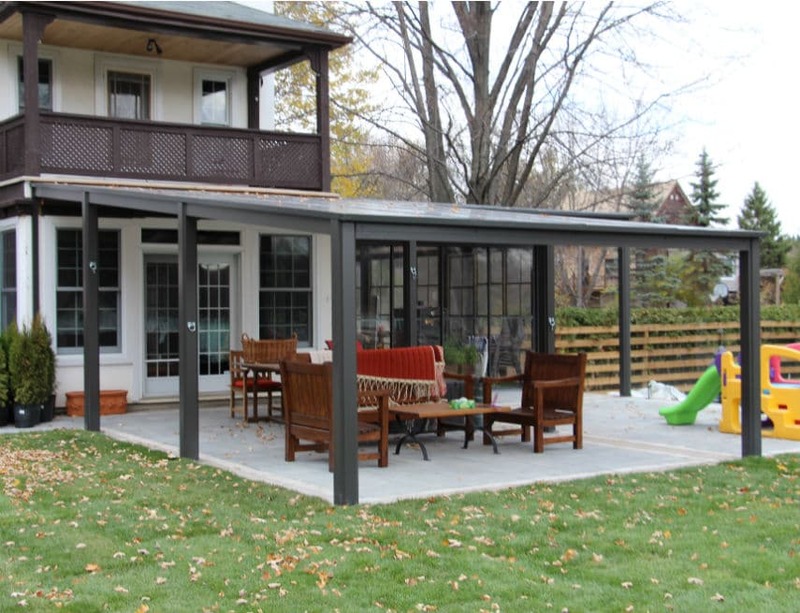 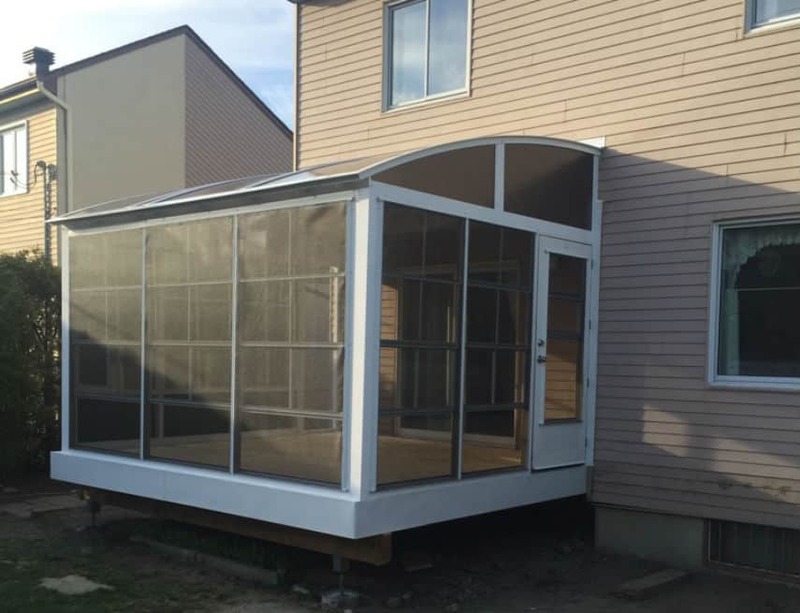 Pictured is a superb 3-season solarium installed on Montréal’s South Shore. 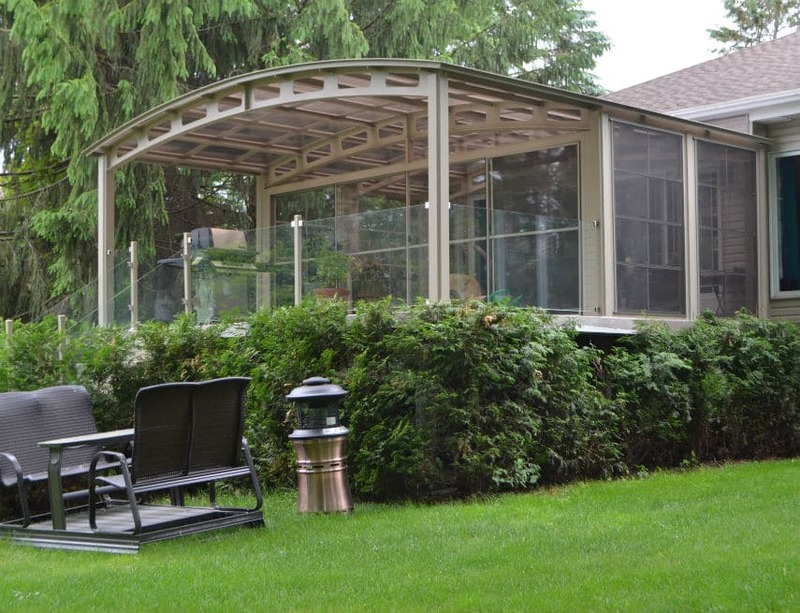 To meet our client’s needs, we built a shelter perfectly moulded to the home’s unusual shape. 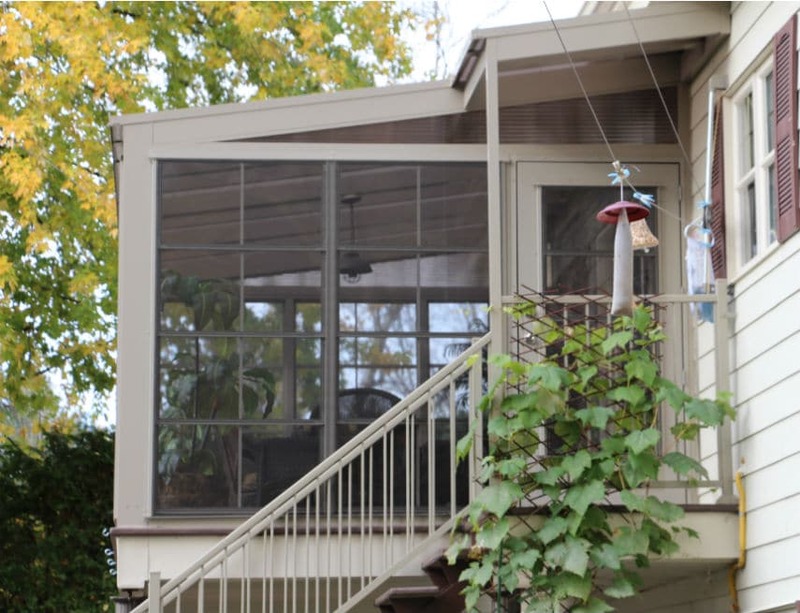 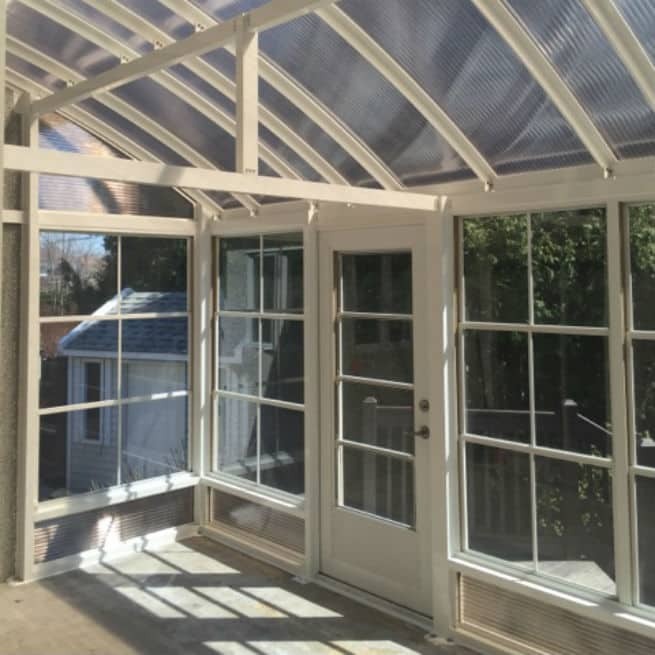 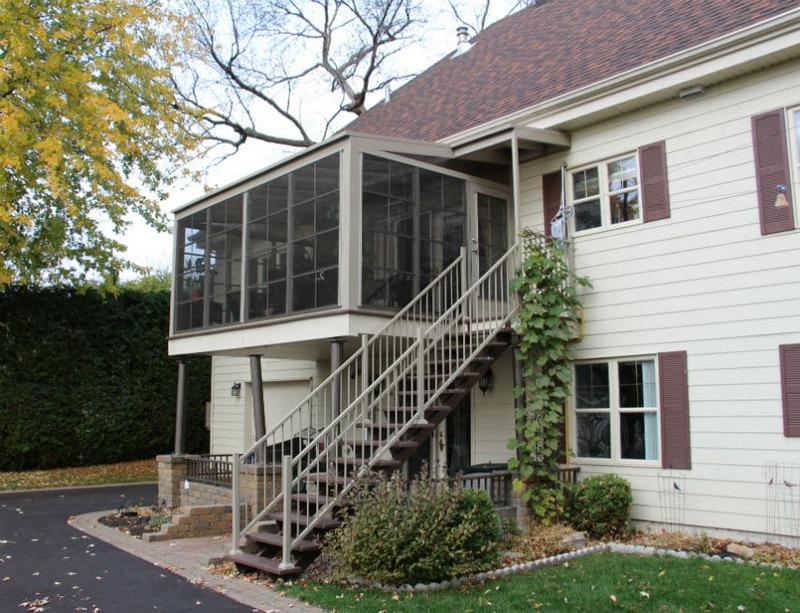 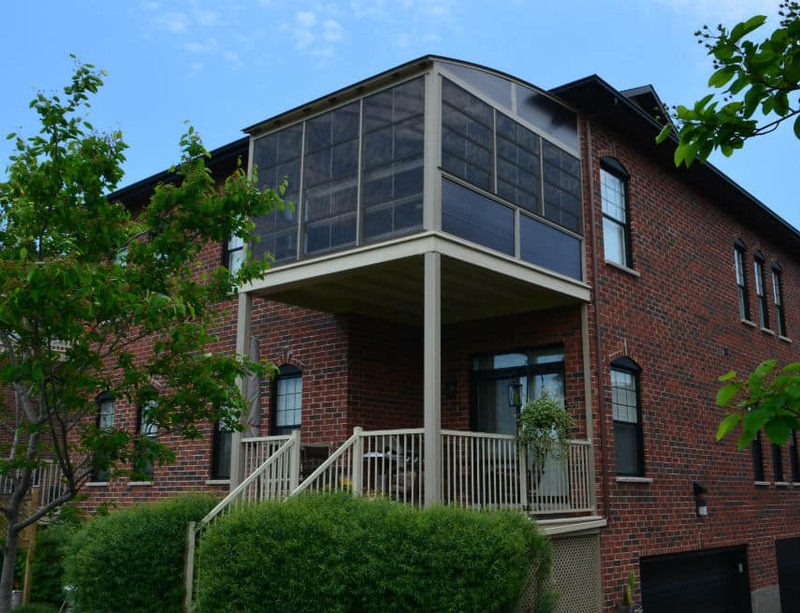 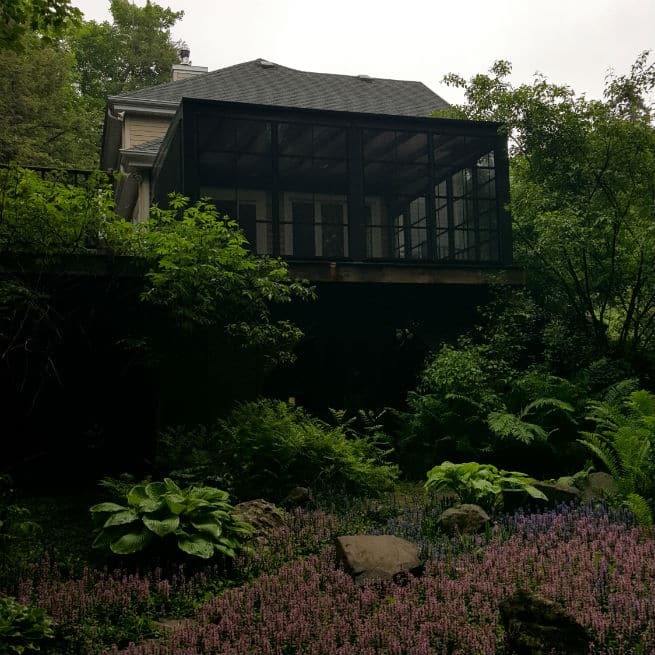 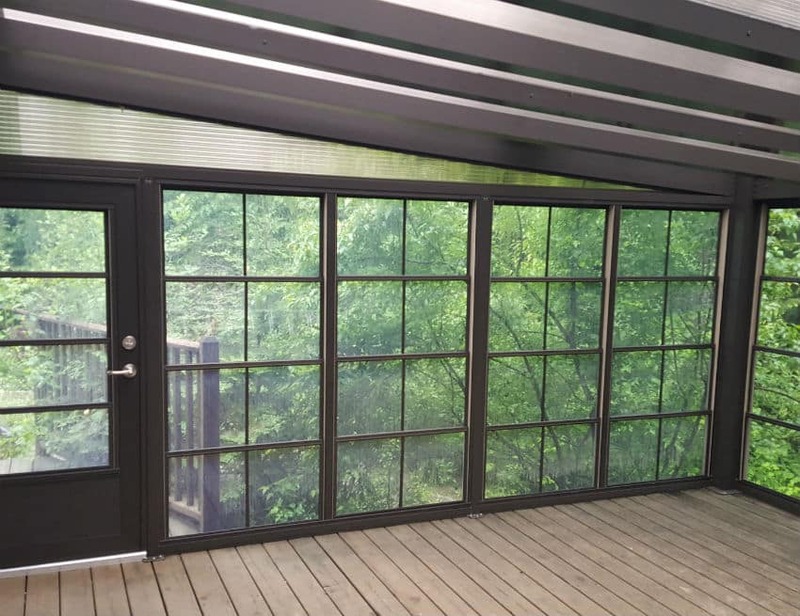 With plenty of height and its abundant fenestration, our customer benefits year-round from a pleasant, convivial space in both the living room and dining room sections. 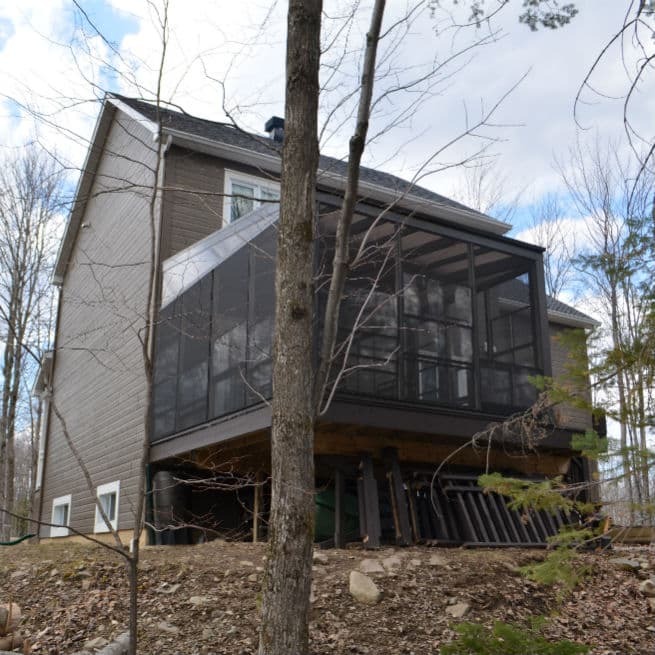 Some shelter models (Discretion and Intense) with 3/16-in. 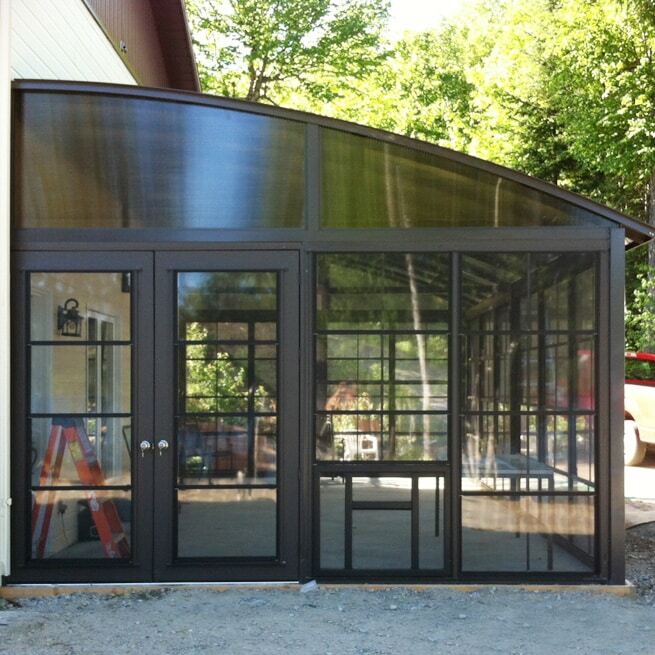 44W-treated steel arches allow for uniform load support up to 177 lb./sq. 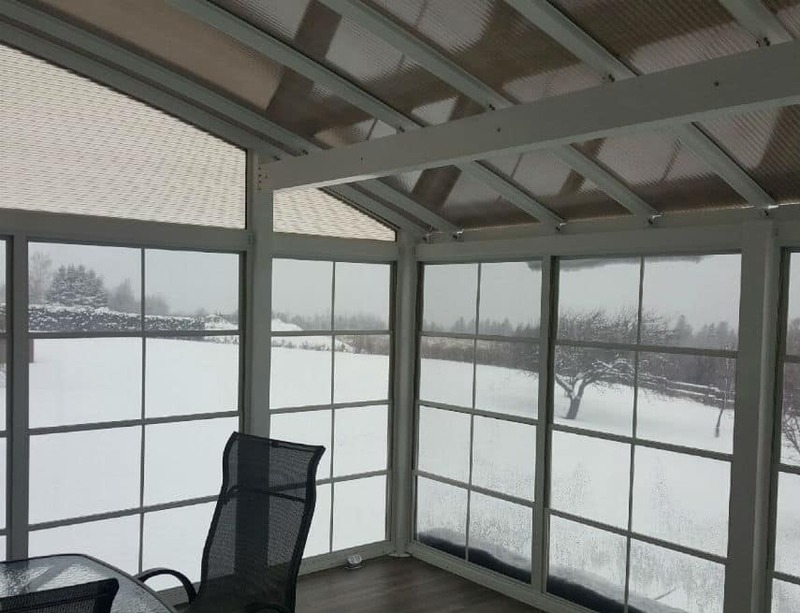 ft. – ideal for large shelters or places that get heavy snowfalls. 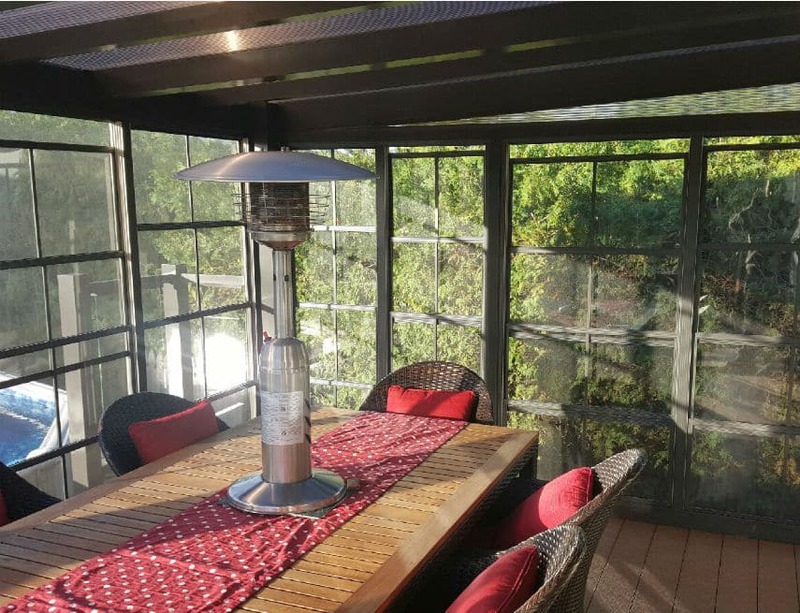 Cet abri de type véranda 3 saisons a été conçu pour répondre aux besoins très précis de notre cliente. 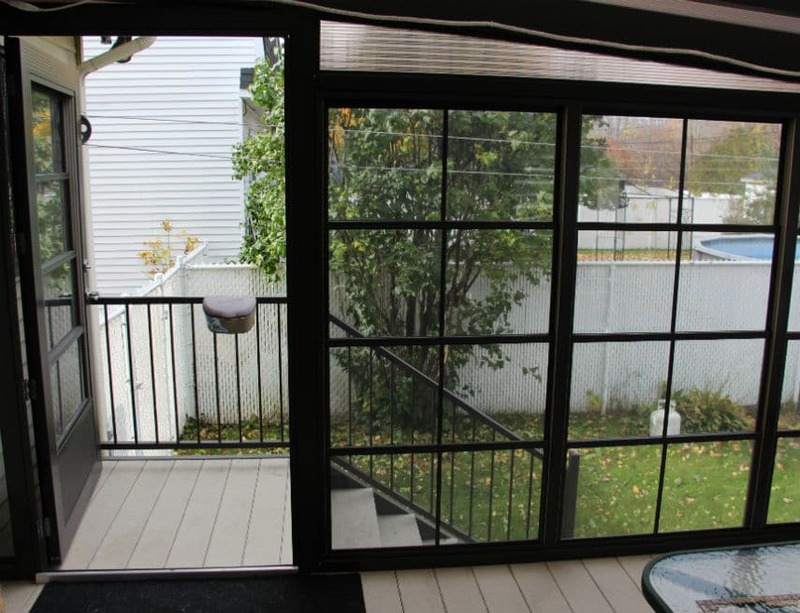 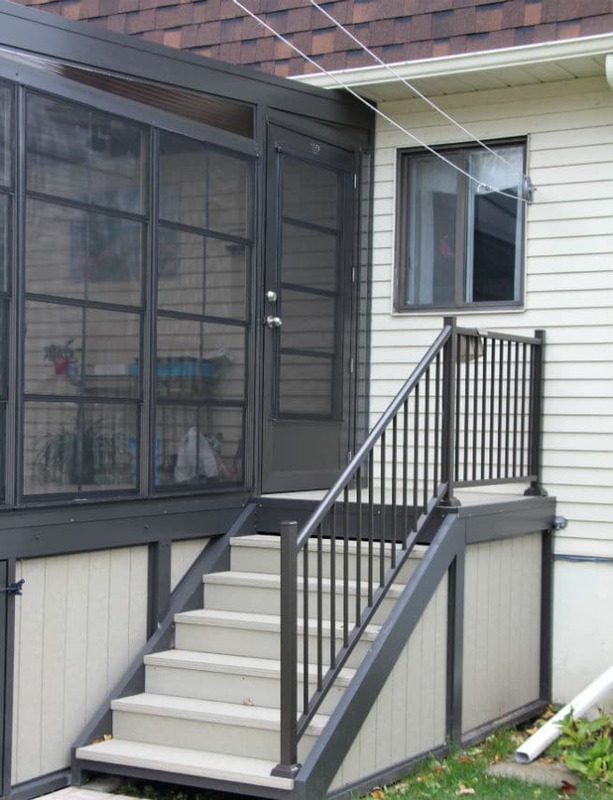 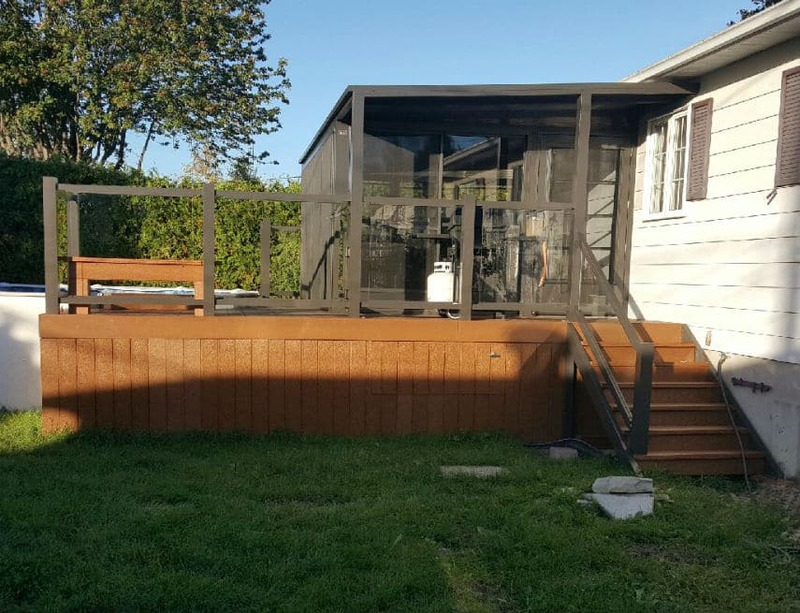 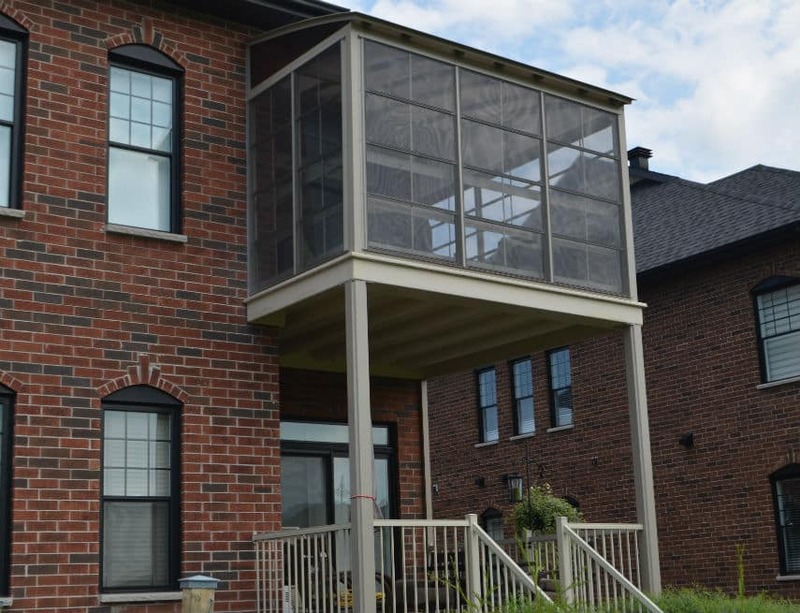 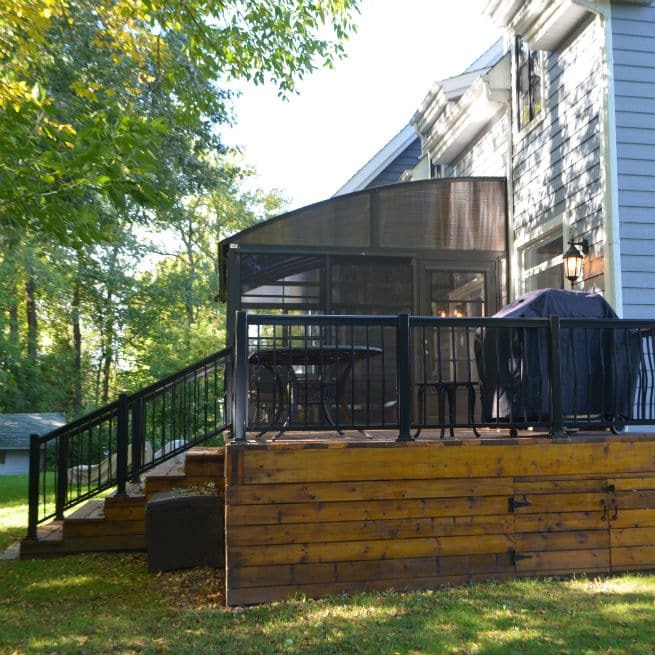 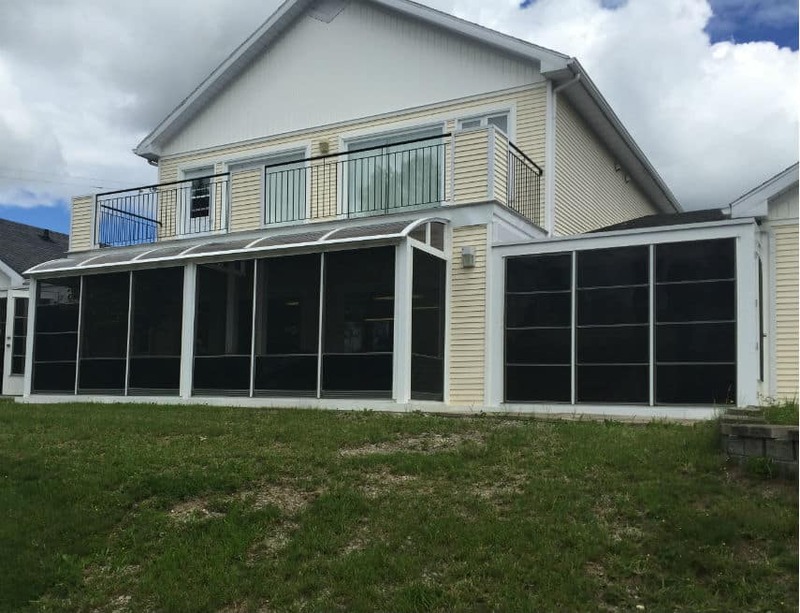 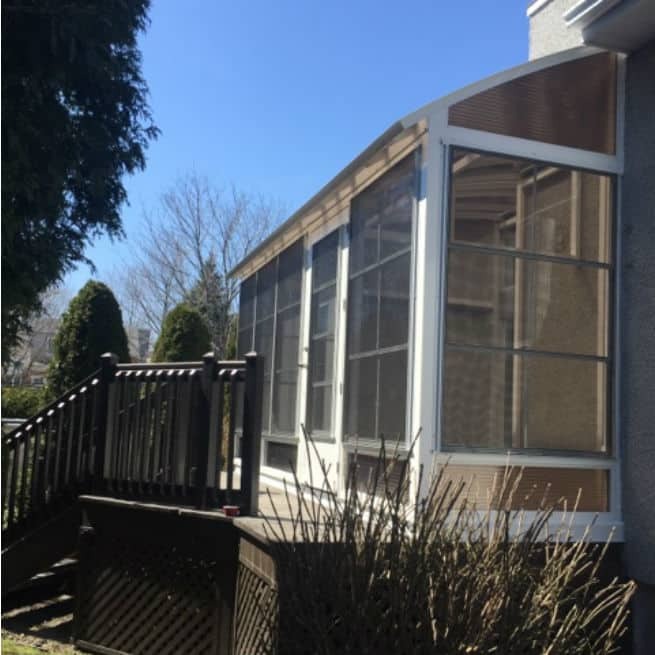 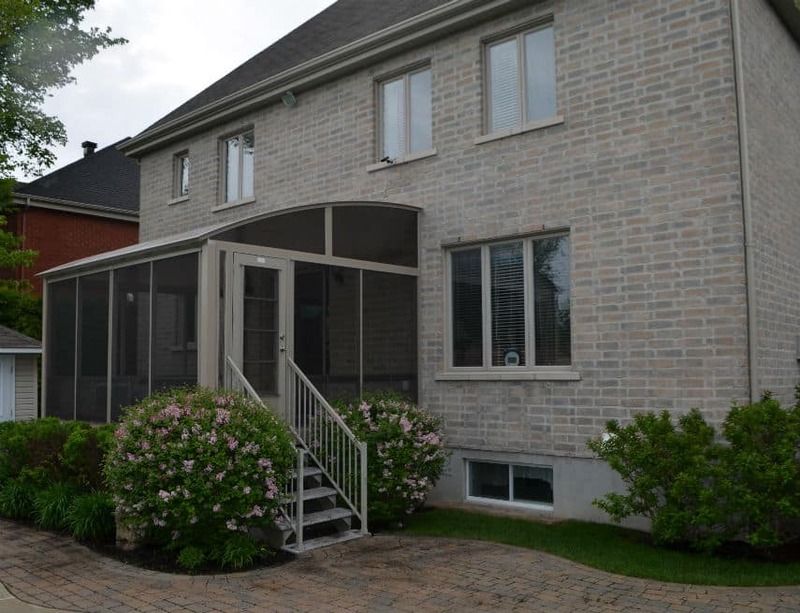 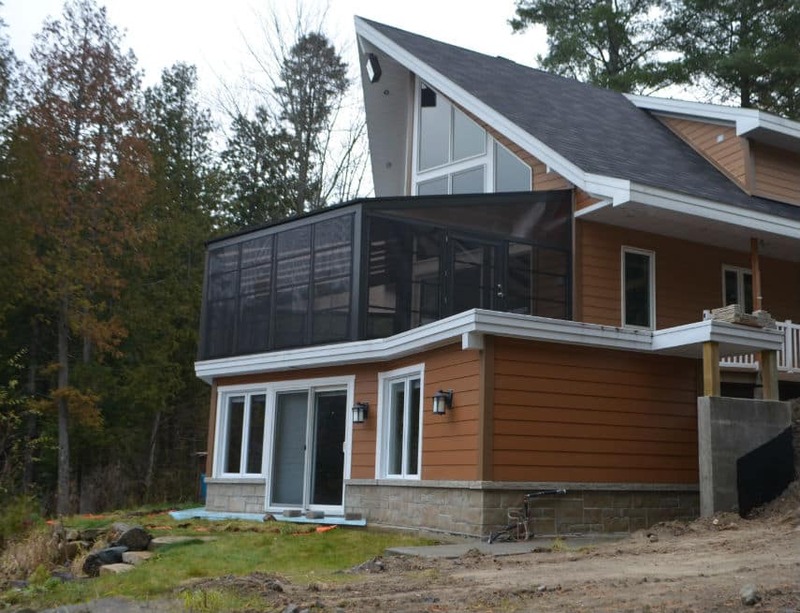 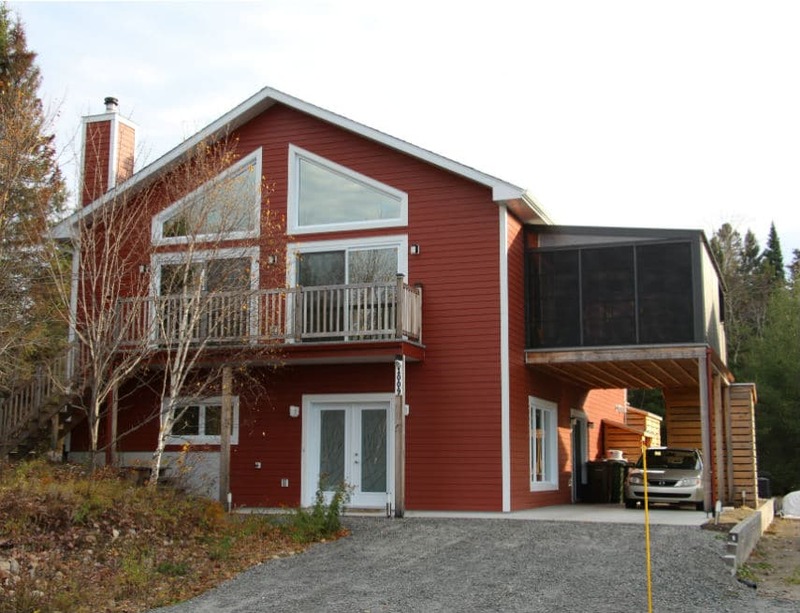 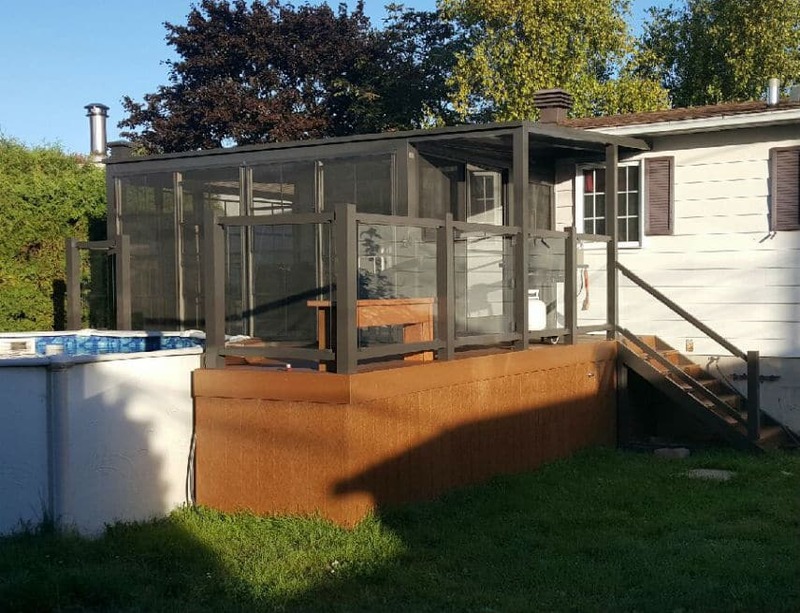 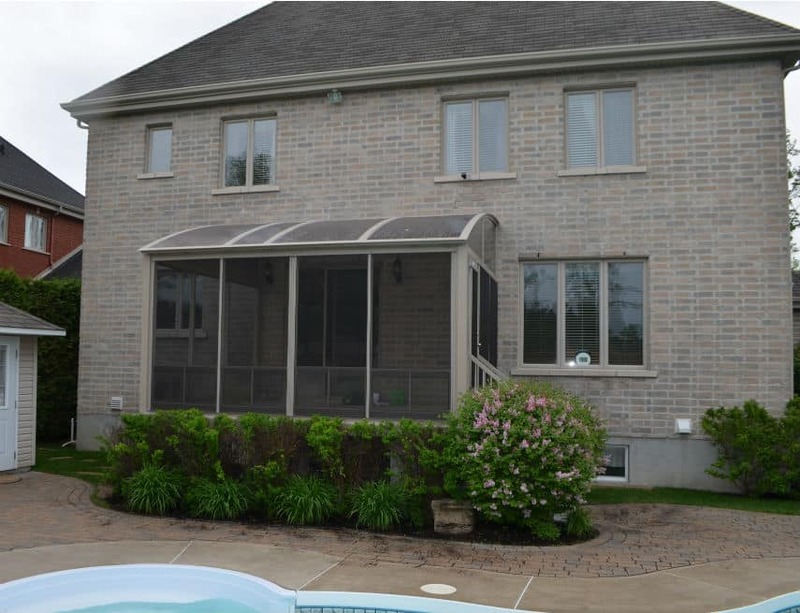 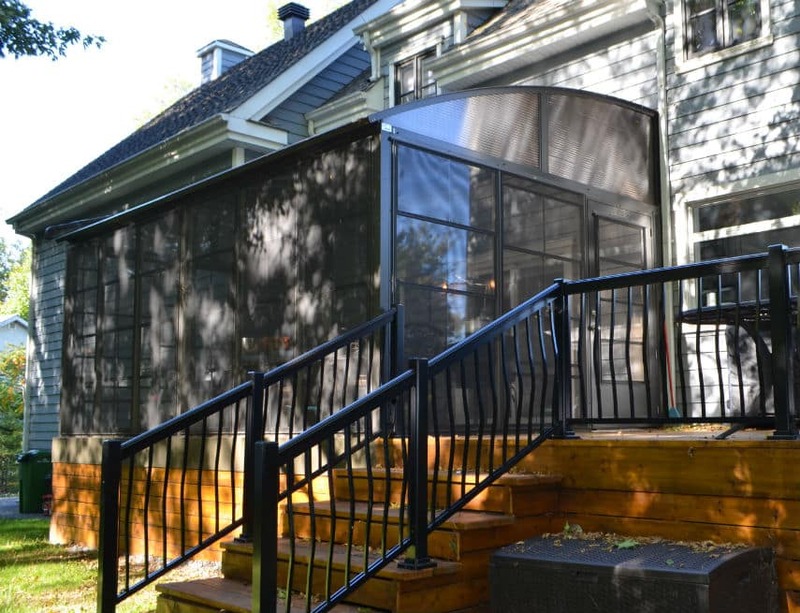 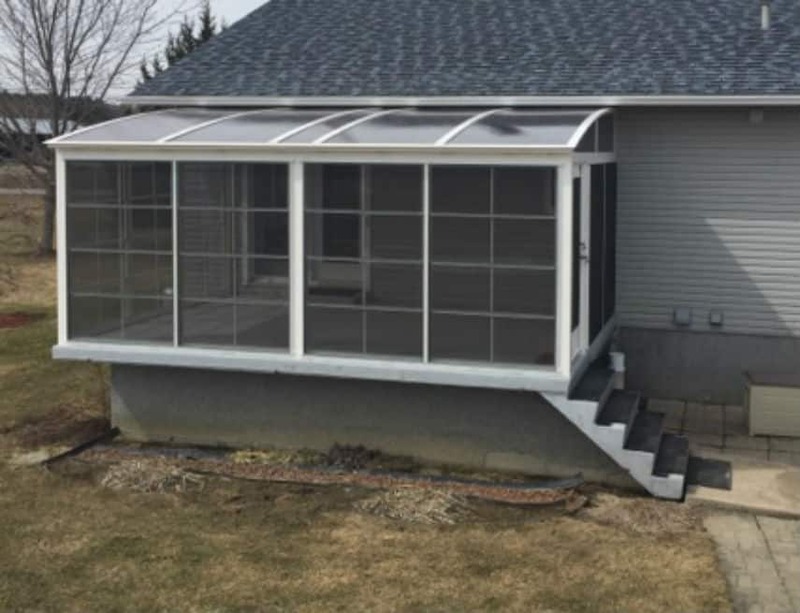 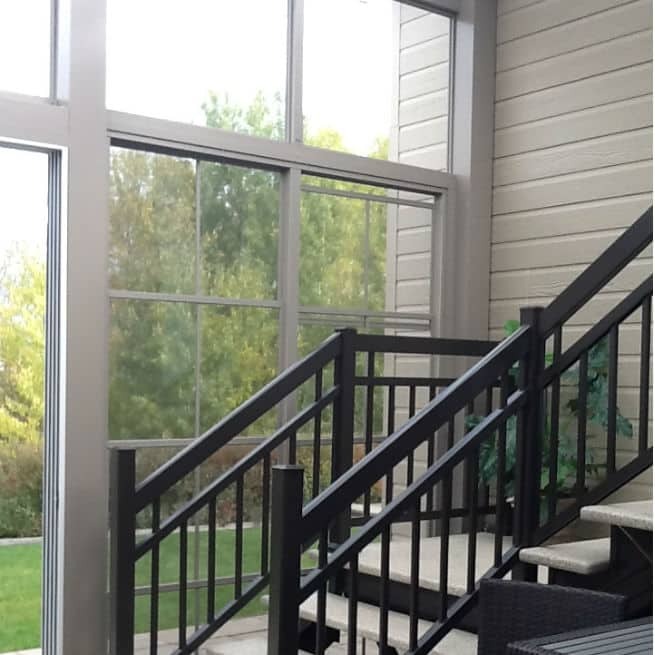 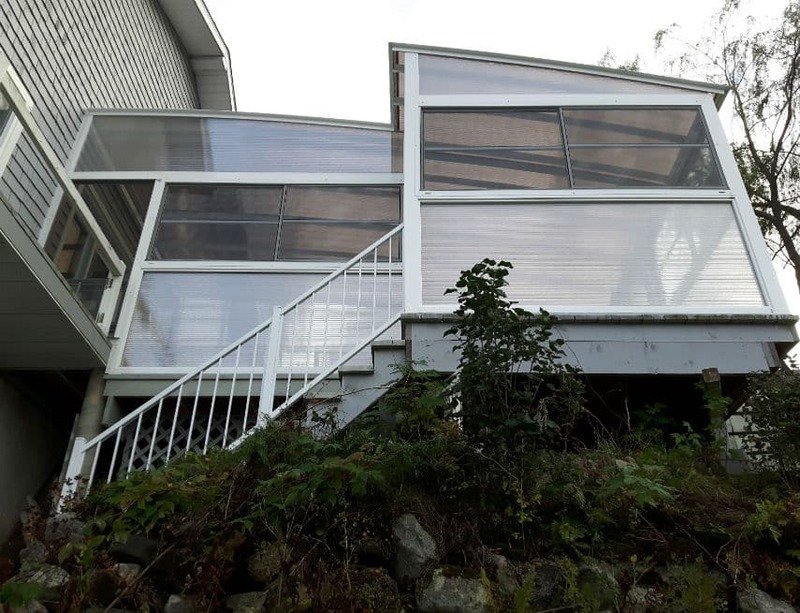 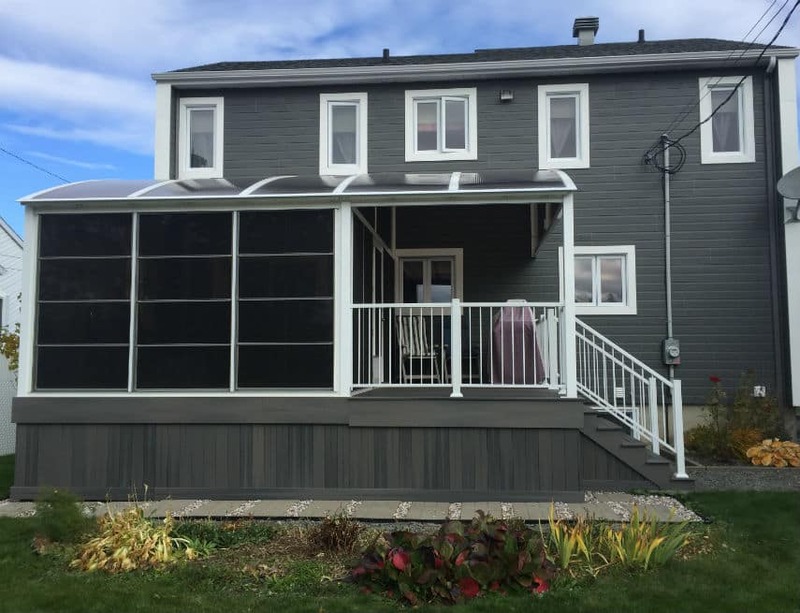 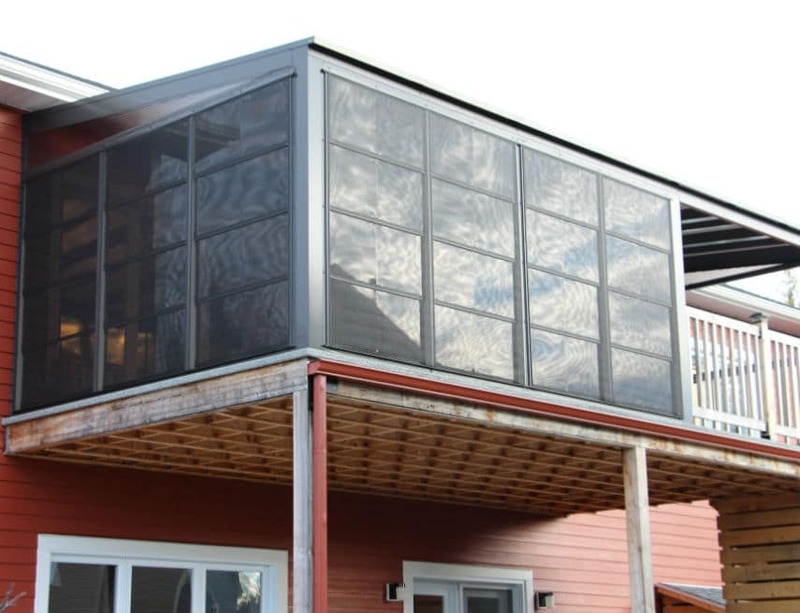 Sur cette résidence de Laval, nous avons fabriqué et installé, en plus de la véranda, le balcon en aluminium structural et PVC, ainsi que l’escalier. 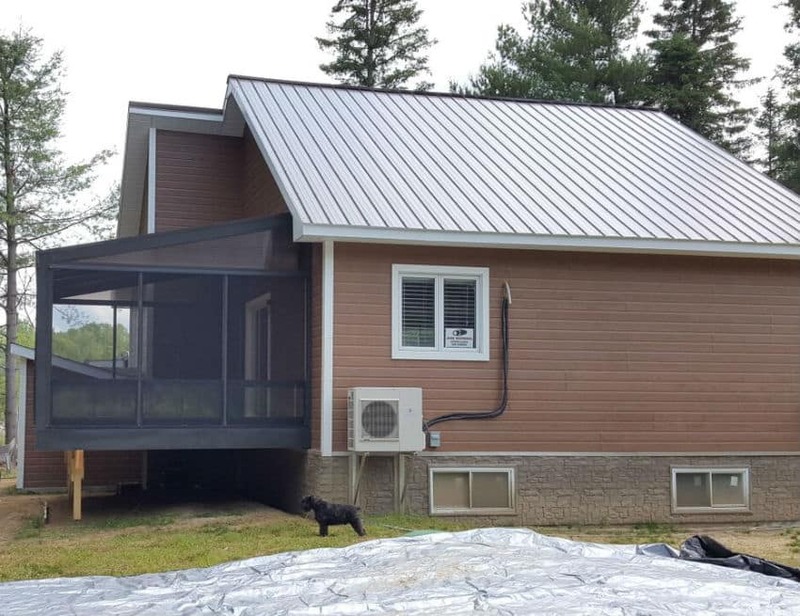 Un mur intimité a aussi été installé afin de respecter la réglementation du code du bâtiment des maisons jumelées. 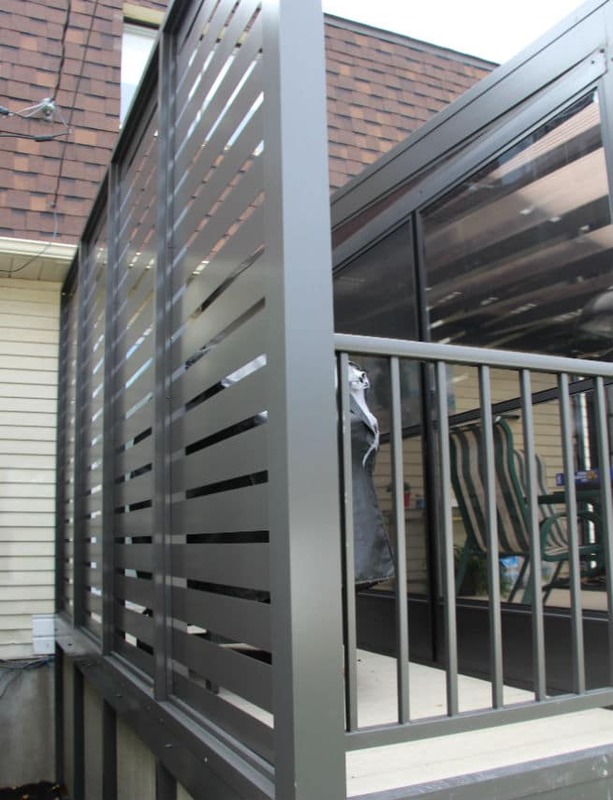 Nous avons ajouté 3 panneaux d’accès sous le balcon pour le rangement et un espace entre l’abri et le panneau décoratif pour le BBQ afin de rendre l’espace pratique.